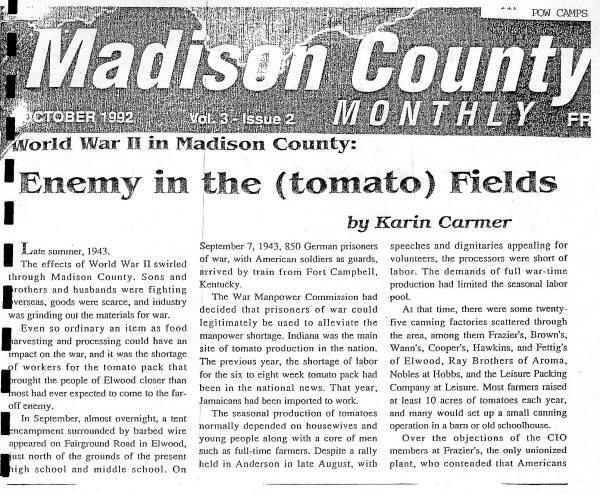 In the summer of 1943, Madison County had a poor crop of tomatoes; however, that didn’t mean that there were no tomatoes to pick. 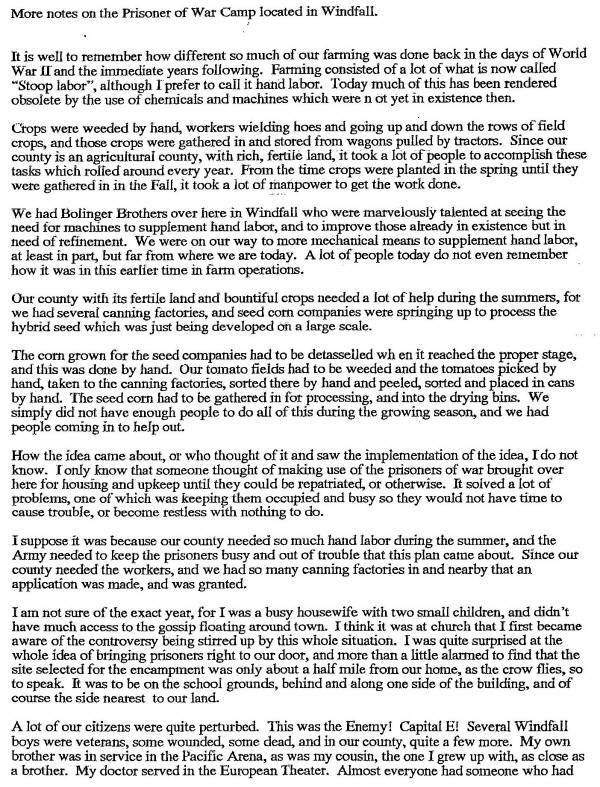 The ups and downs in agriculture has greatly been affected by the weather and the amount of rain in all seasons. 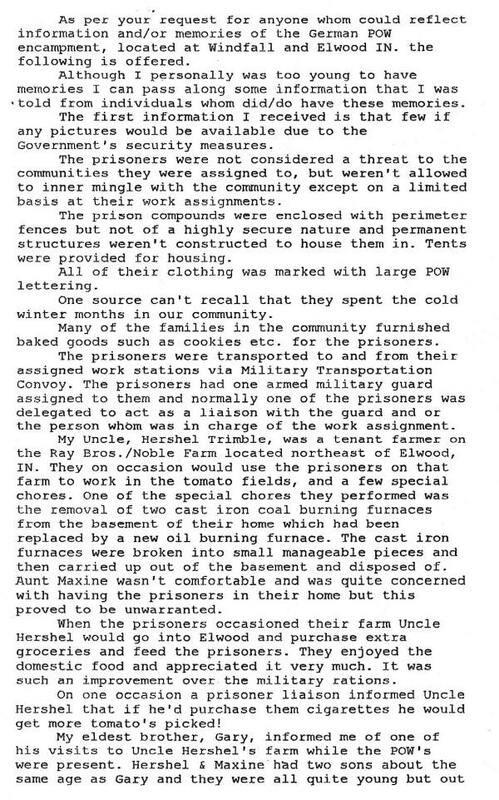 This was not unusual and in normal times temporary and local workers would have been in the fields and the harvest would have rolled right to the canneries. 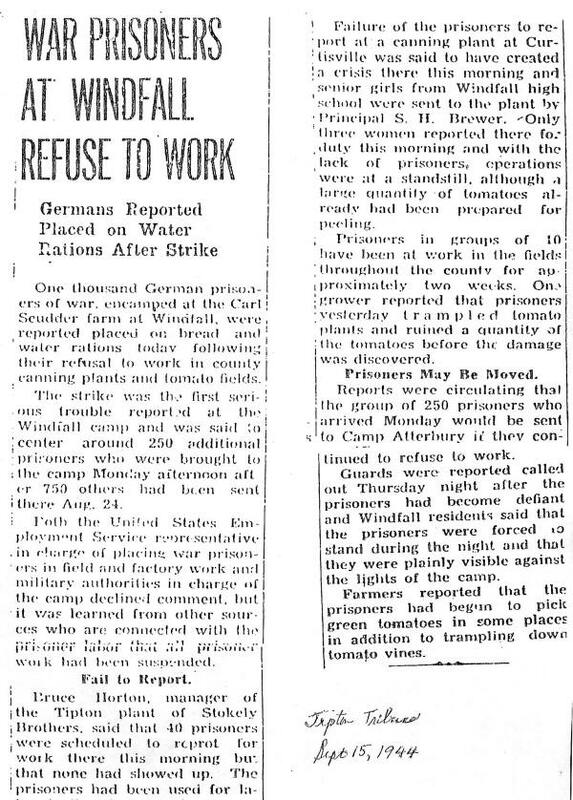 But in 1943, most of the able-bodied workers were away at war so that left a severe shortage of the hands to do most tasks. 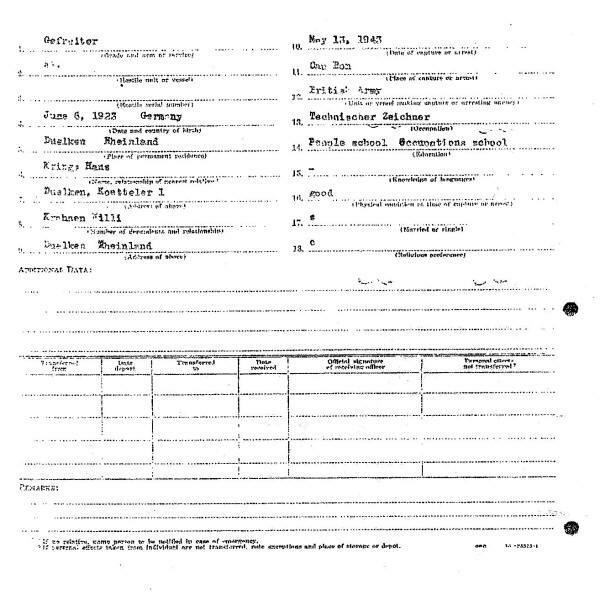 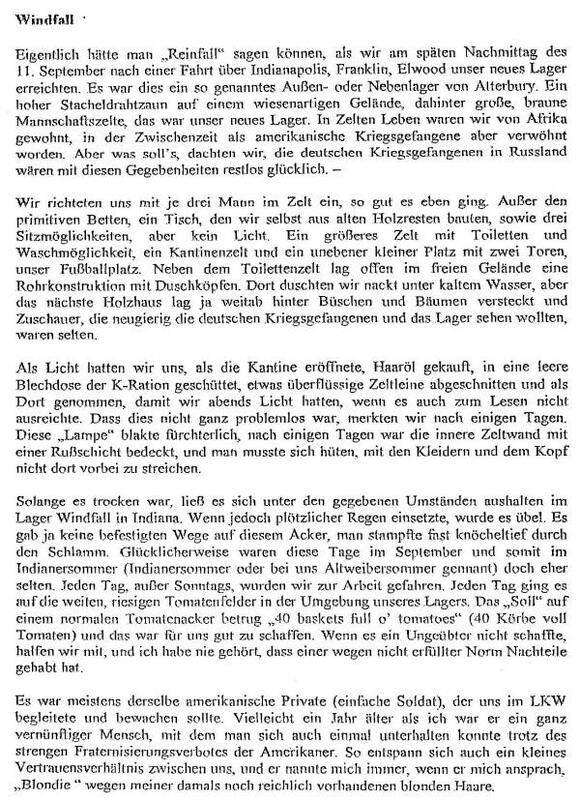 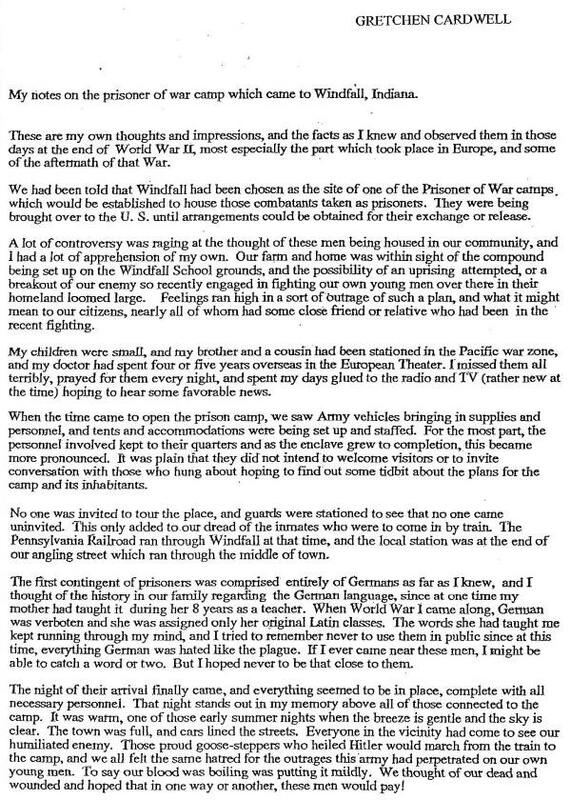 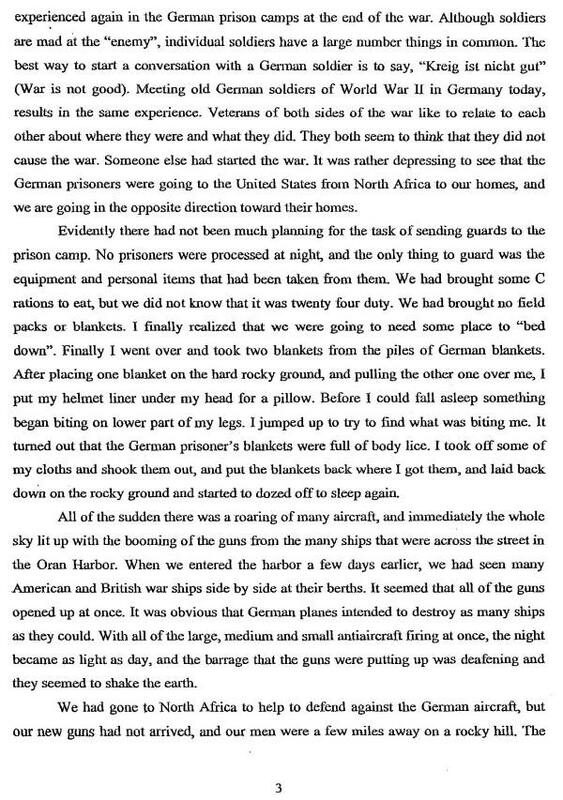 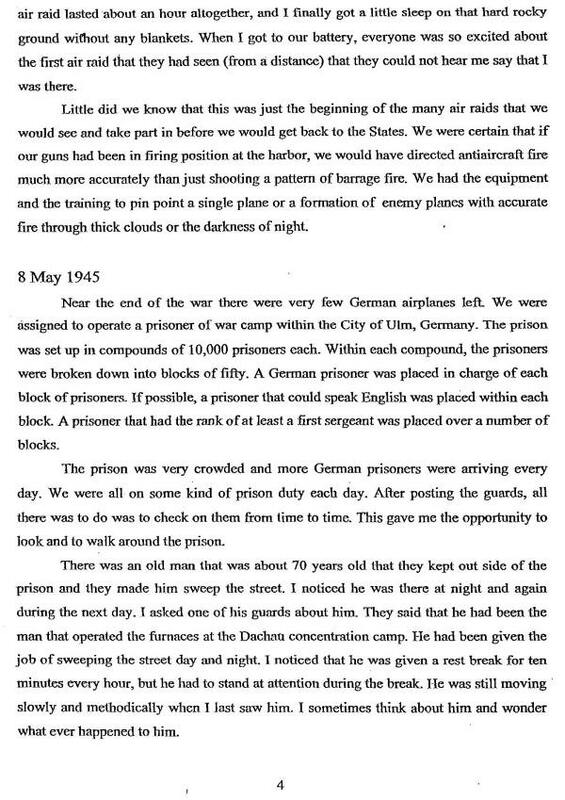 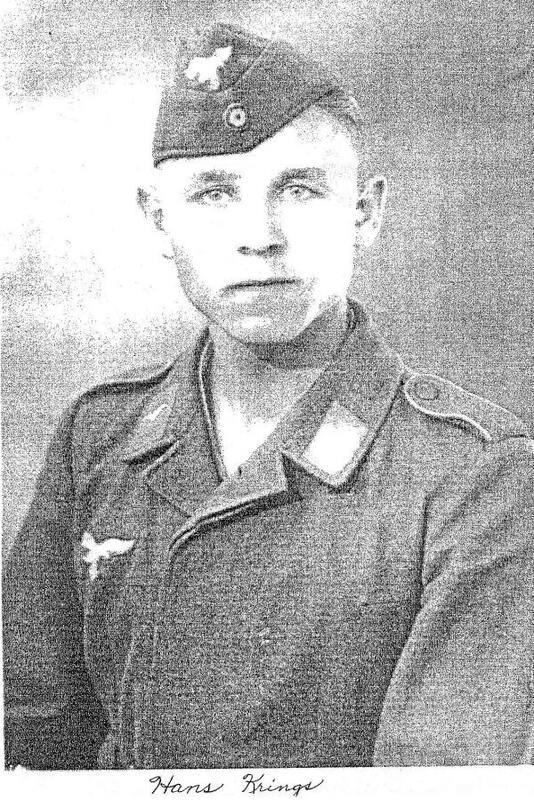 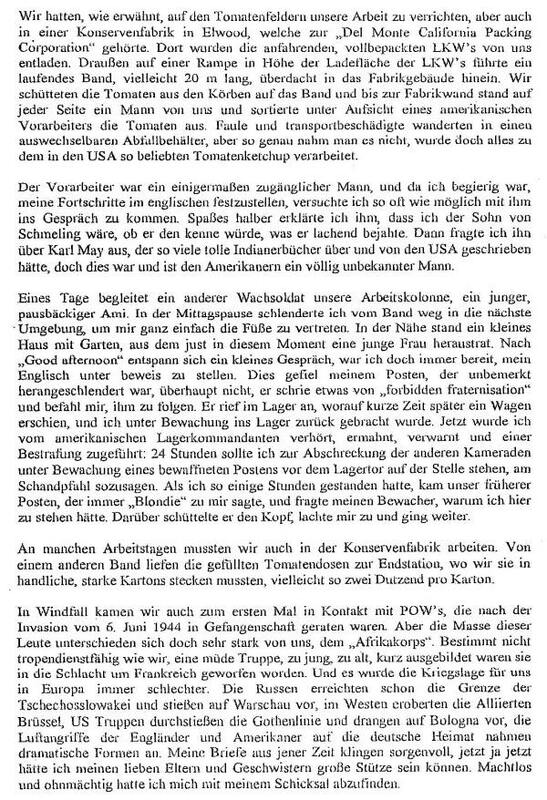 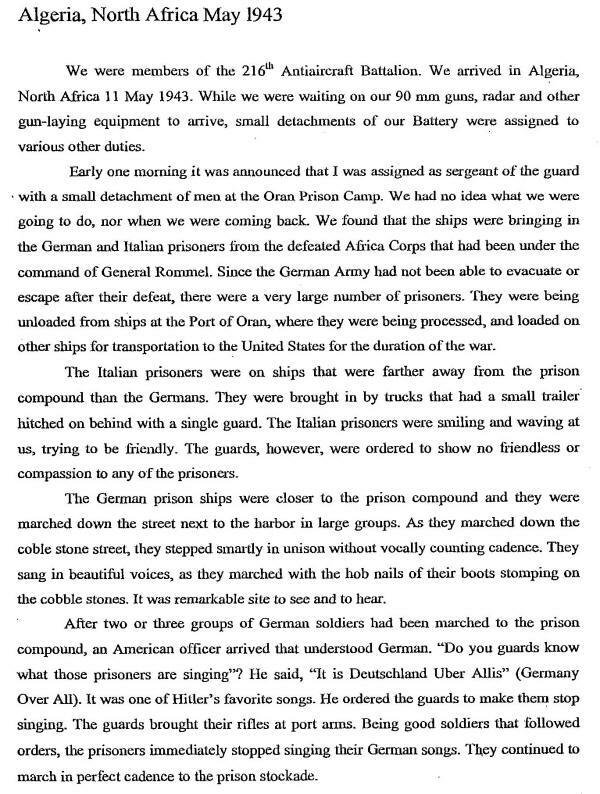 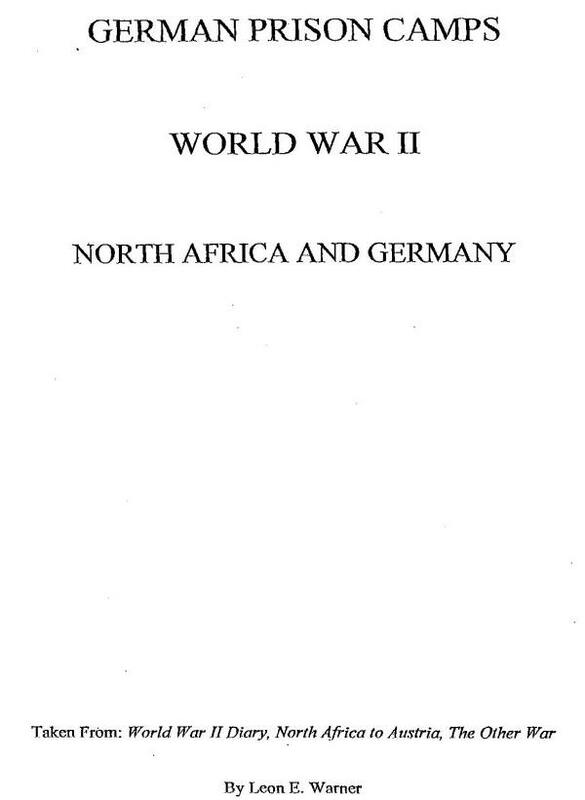 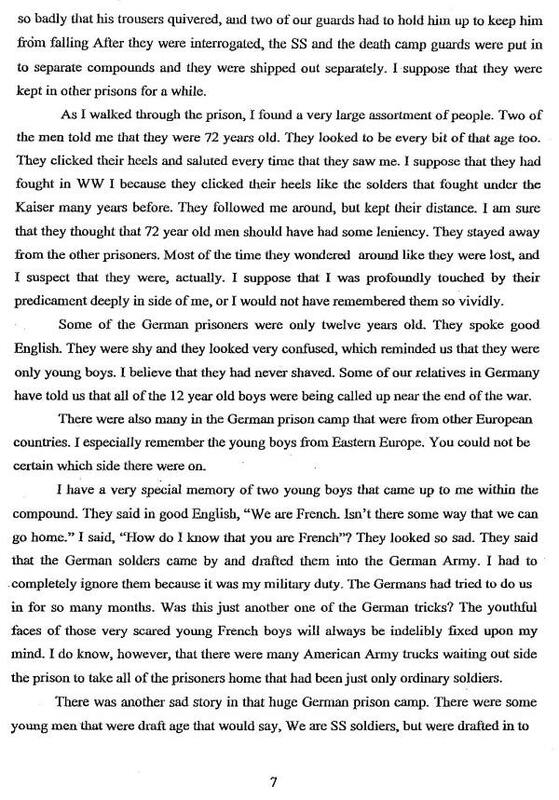 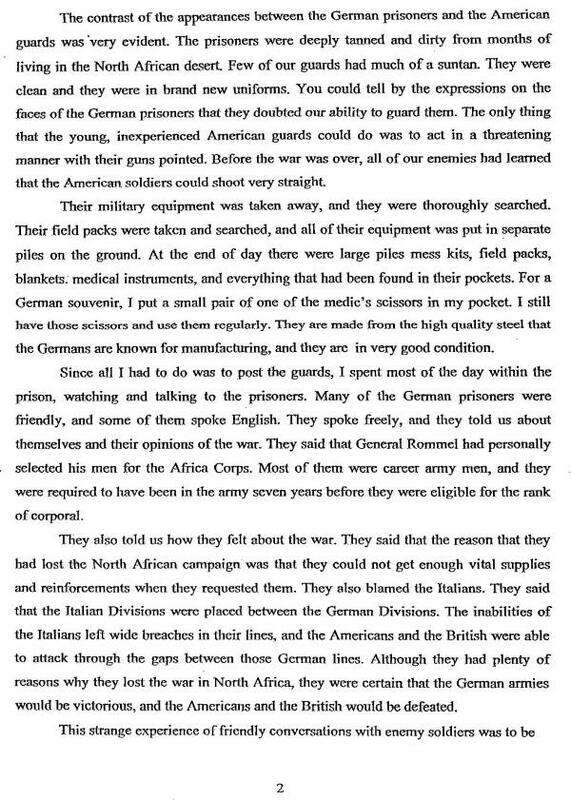 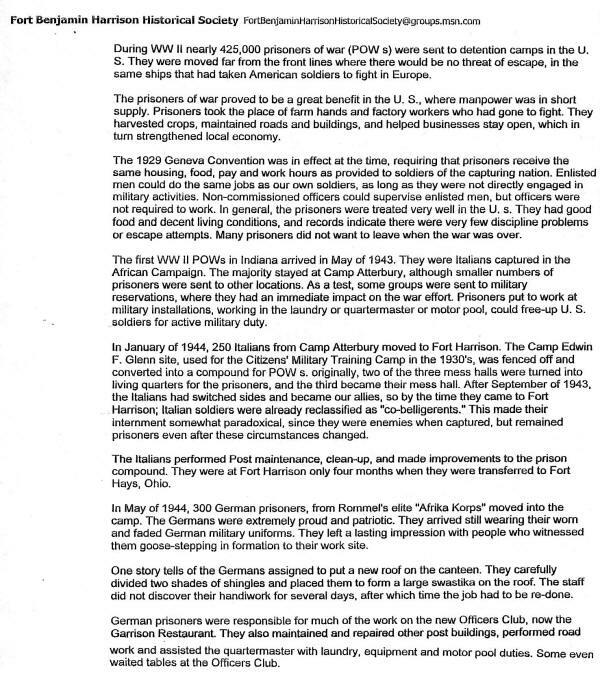 The solution, reached by the War Manpower Commission, was to ship into the area 800 German prisoners of war. 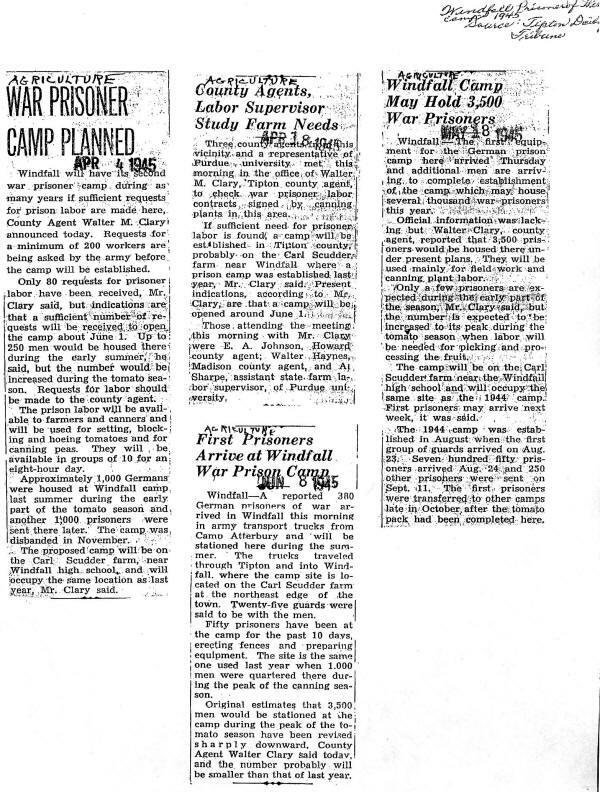 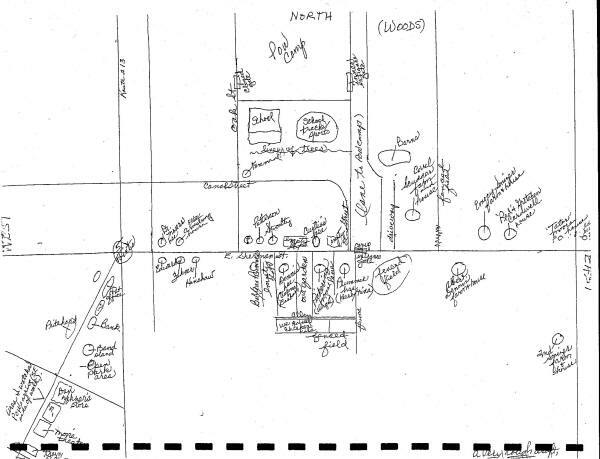 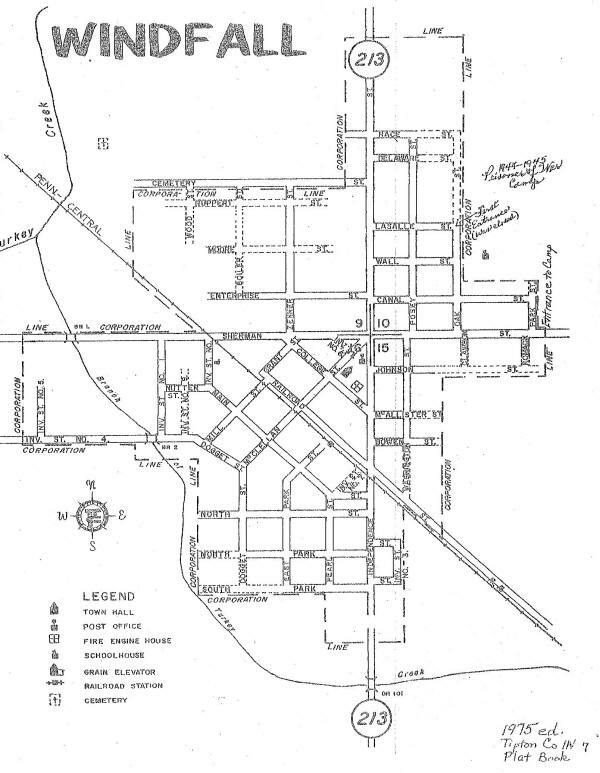 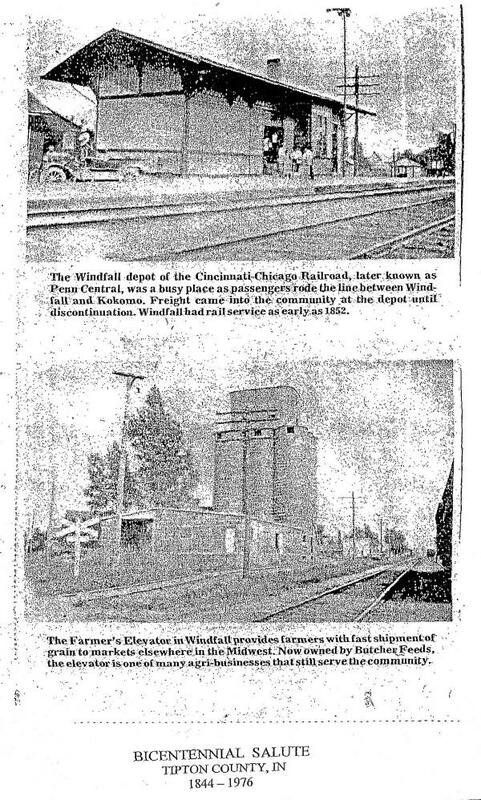 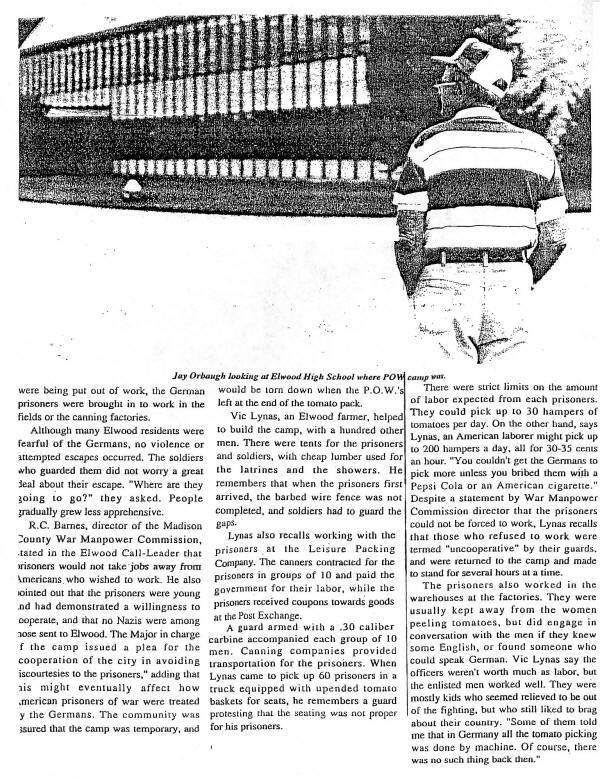 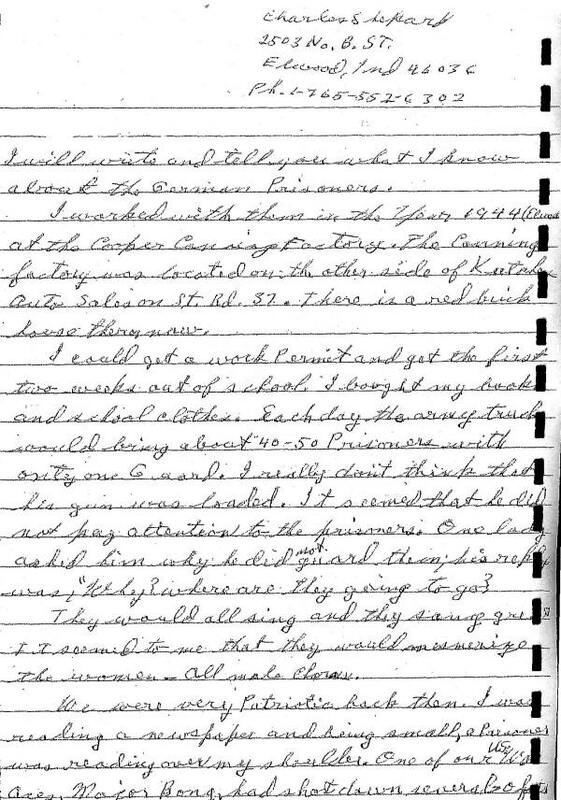 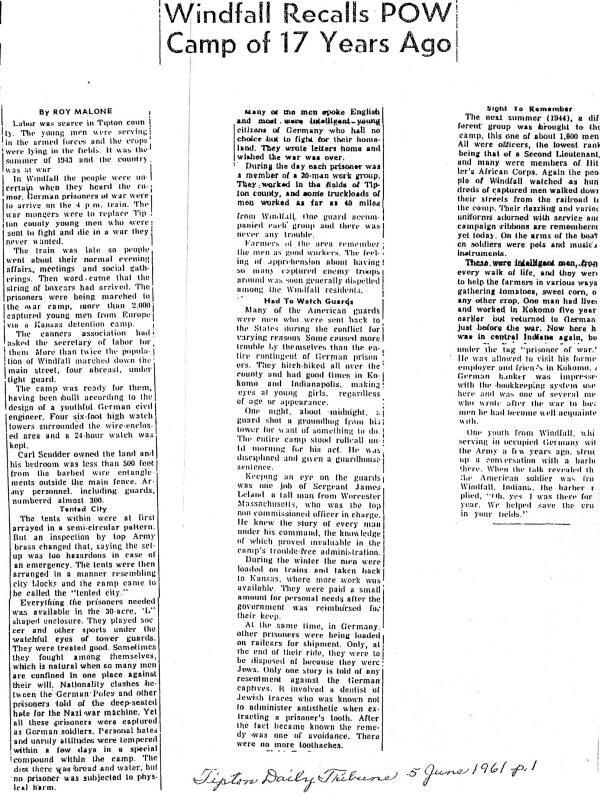 The Elwood Call-Leader had a story informing the people of Elwood that a prison camp was being hastily constructed at the old Elwood fairgrounds at North 19th Street and Fairground Road. 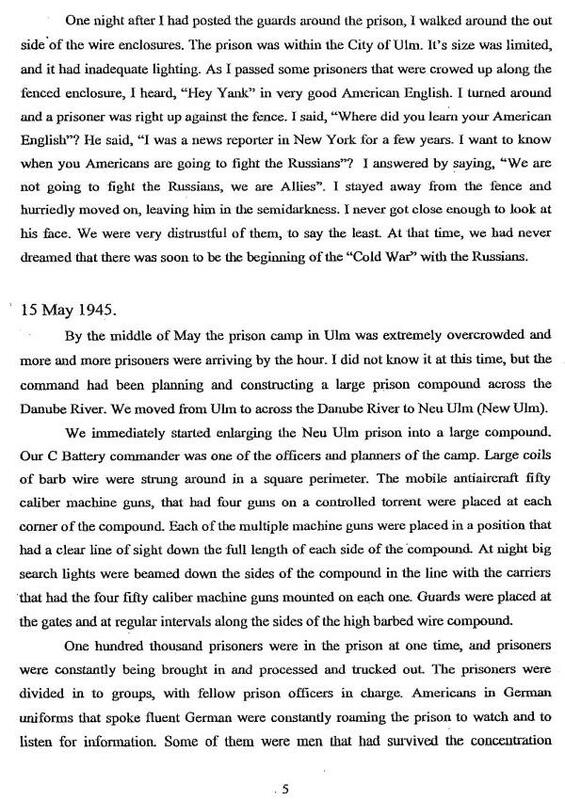 A huge barbed wire enclosure was erected. 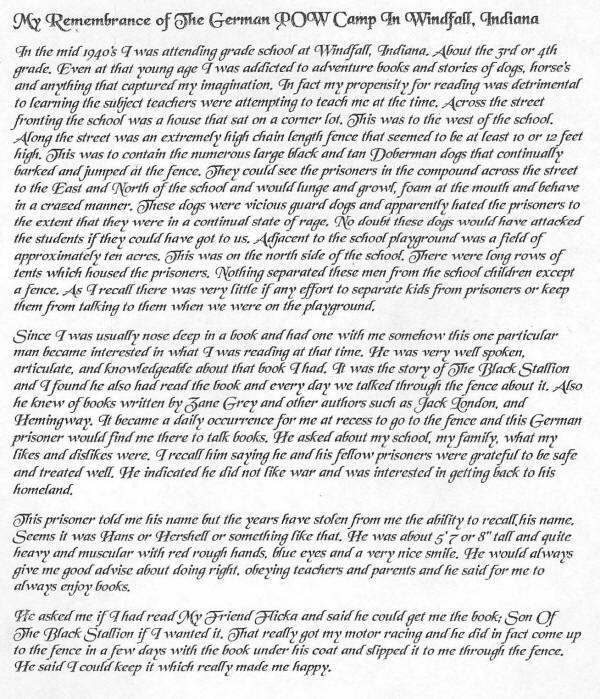 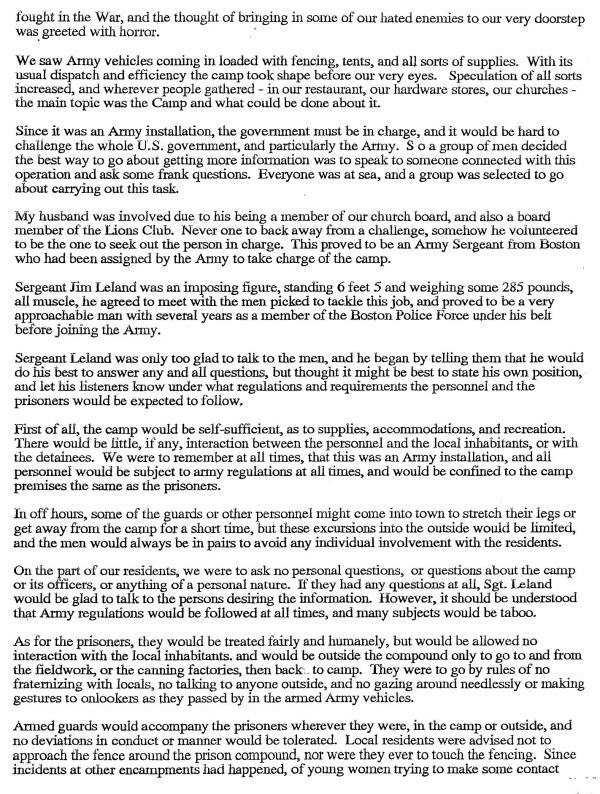 The residents were promised that the prisoners would be under strict guard at all times. 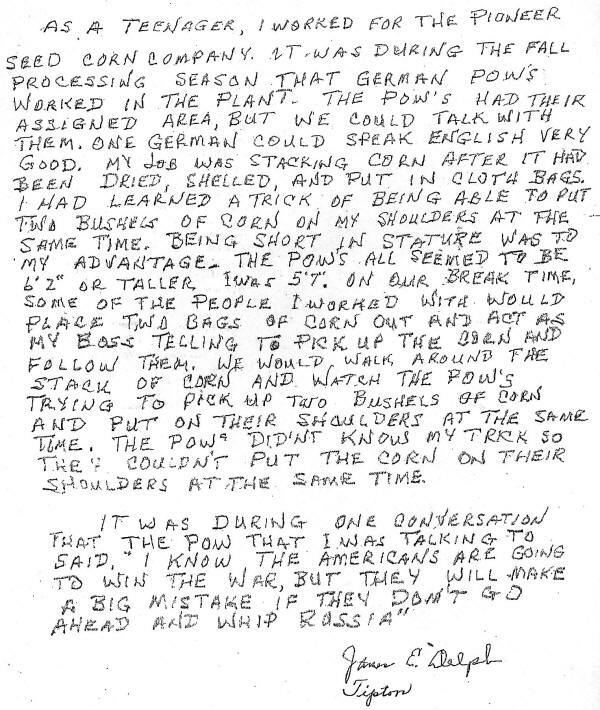 It was not a popular decision. 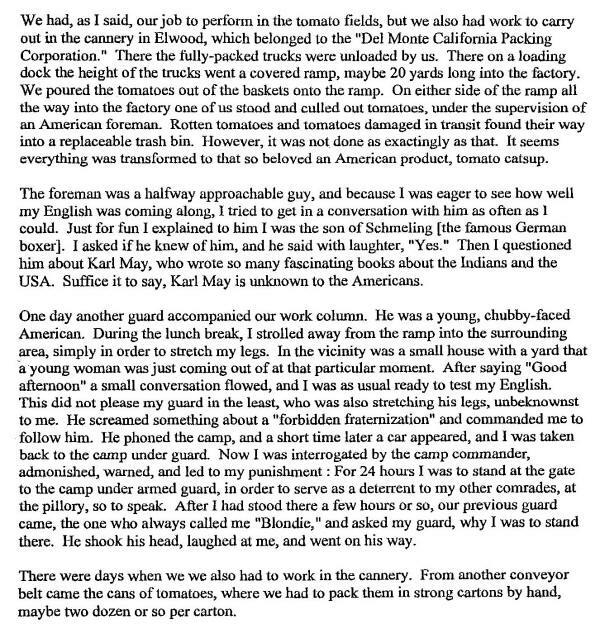 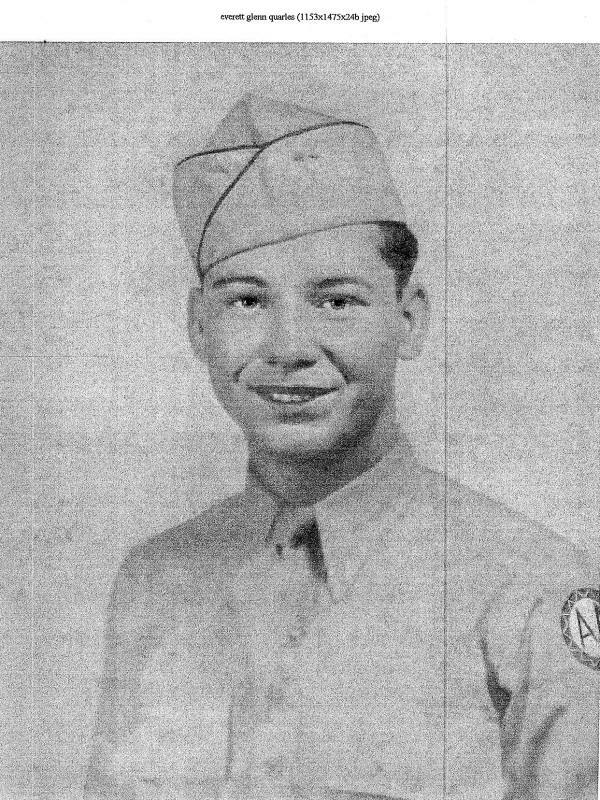 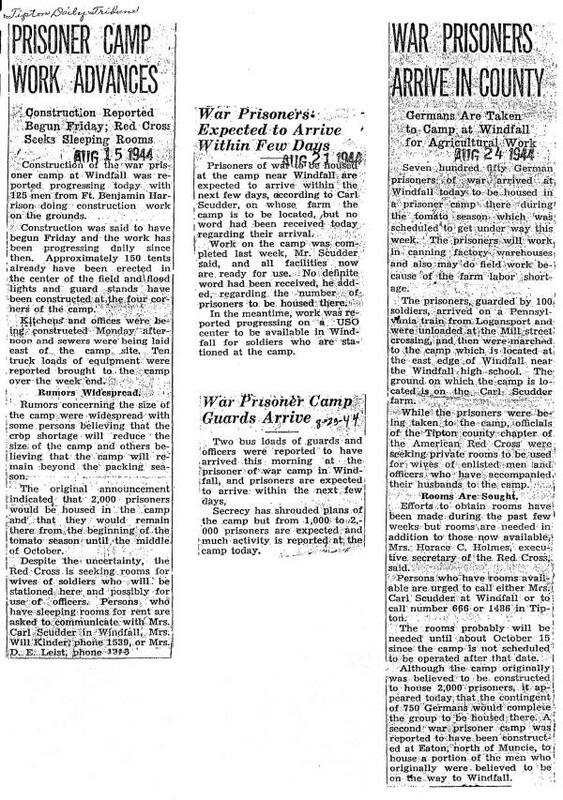 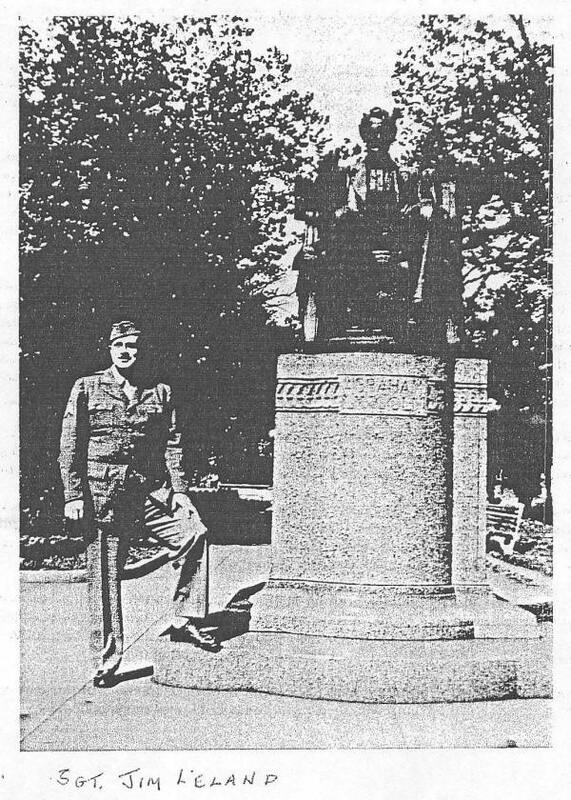 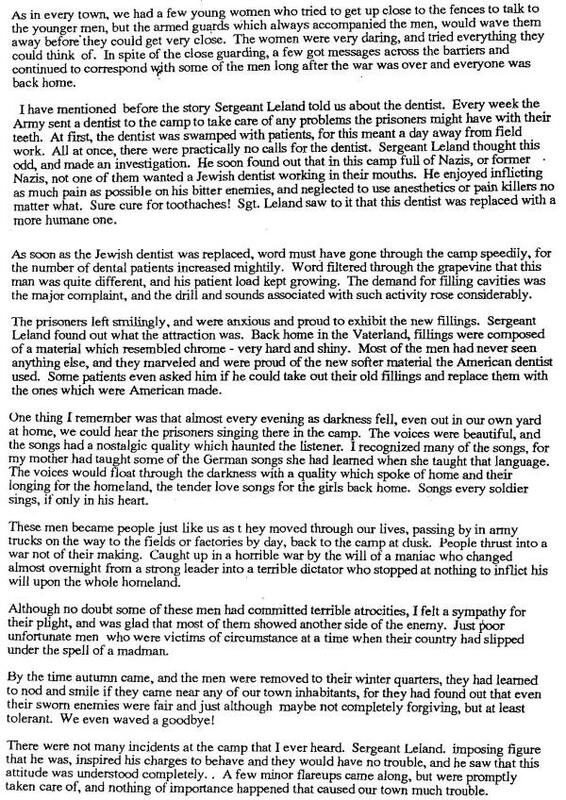 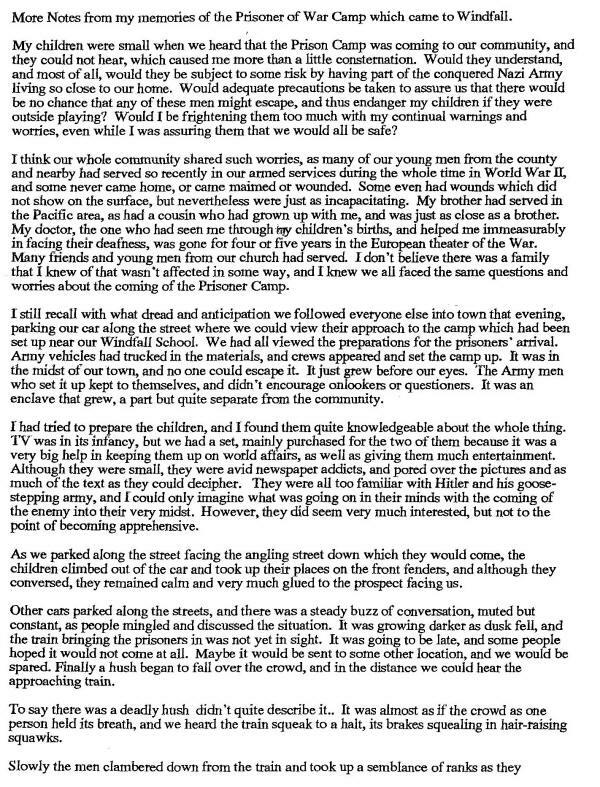 On September 7, 1943, Elwood “bristled” with soldiers, jeeps and Army trucks, as some 800 German POWs were brought in by truck from Camp Breckenridge in Kentucky. 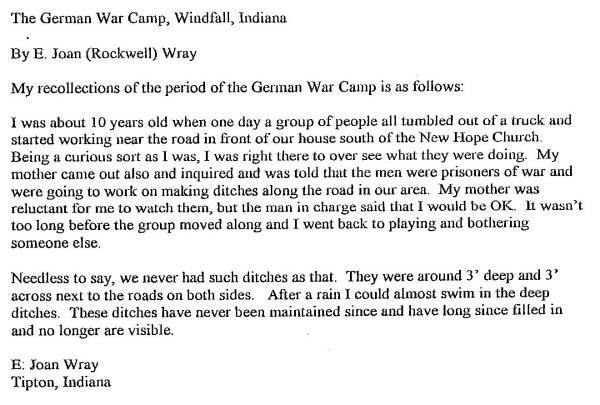 This method of transport saved both the POWs and the community a tense encounter. 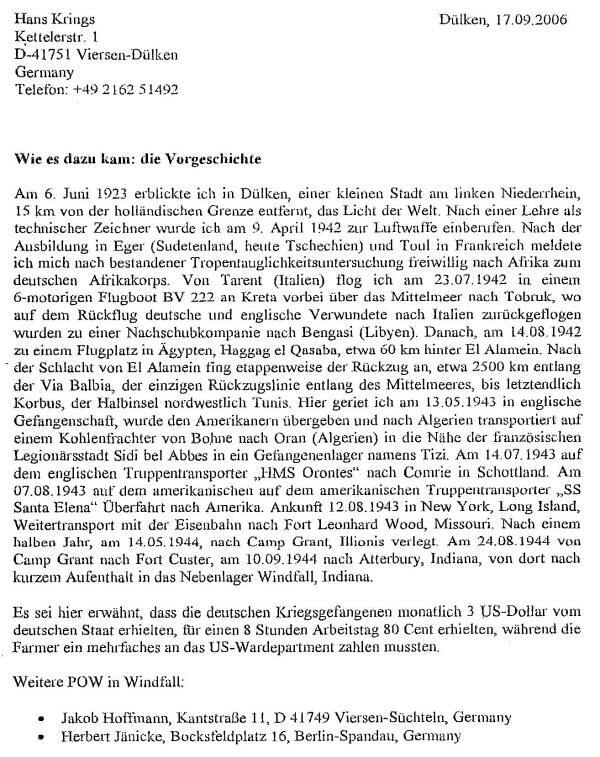 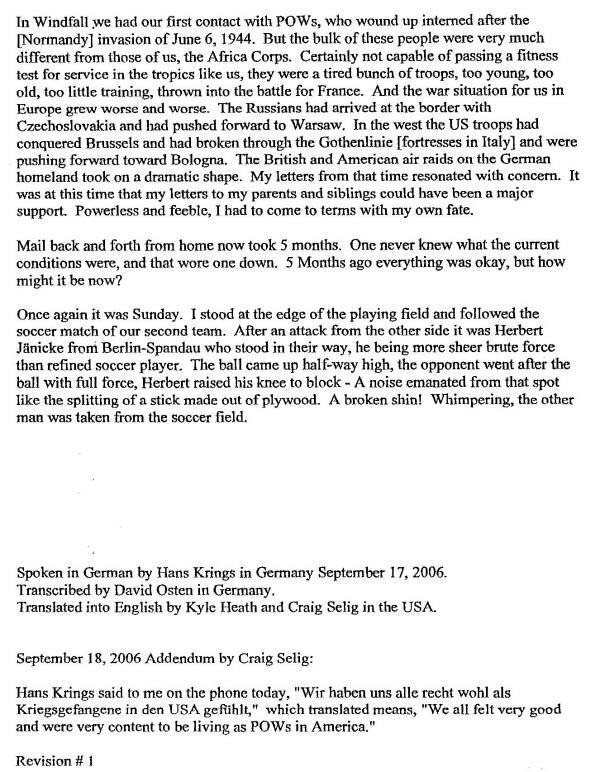 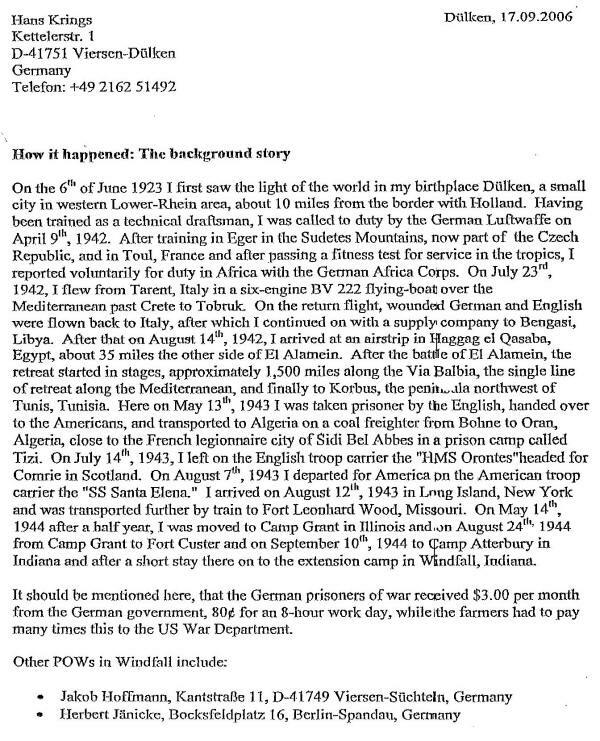 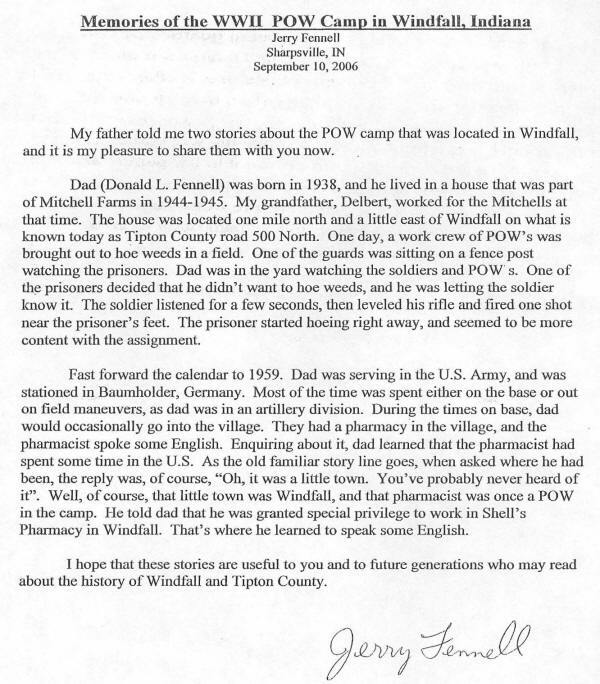 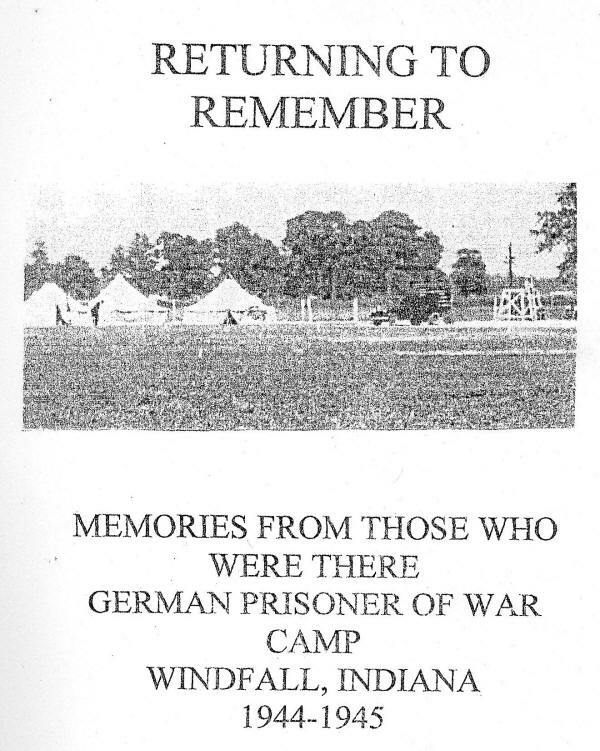 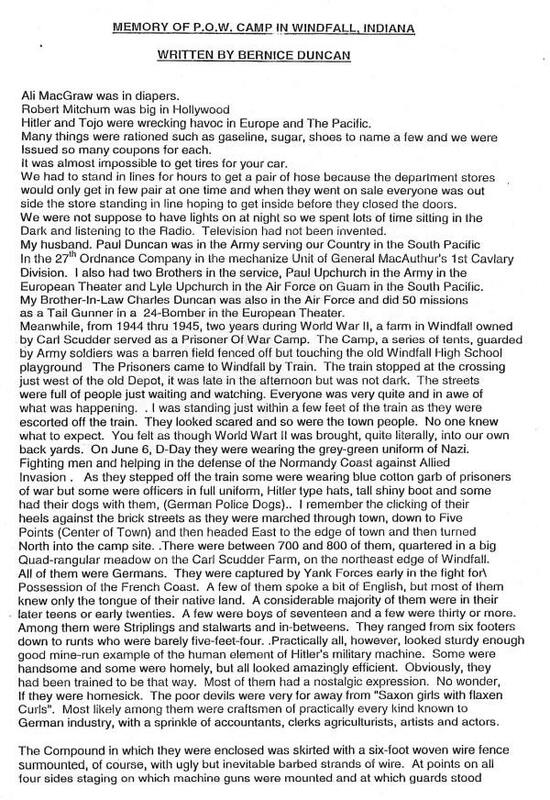 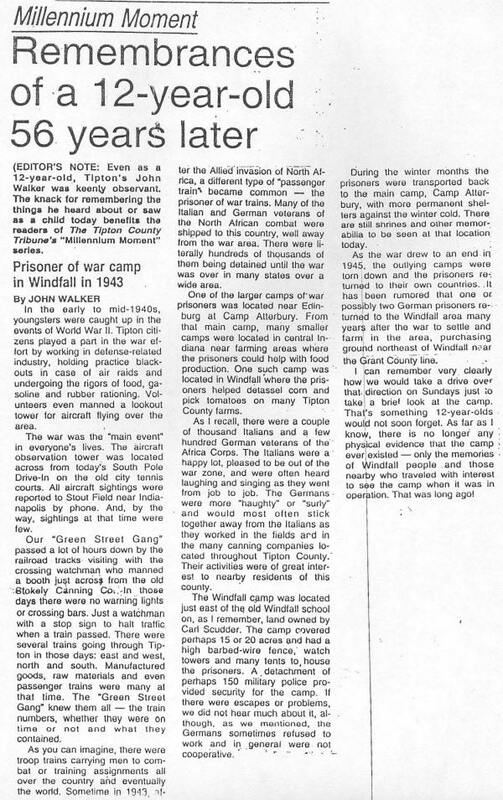 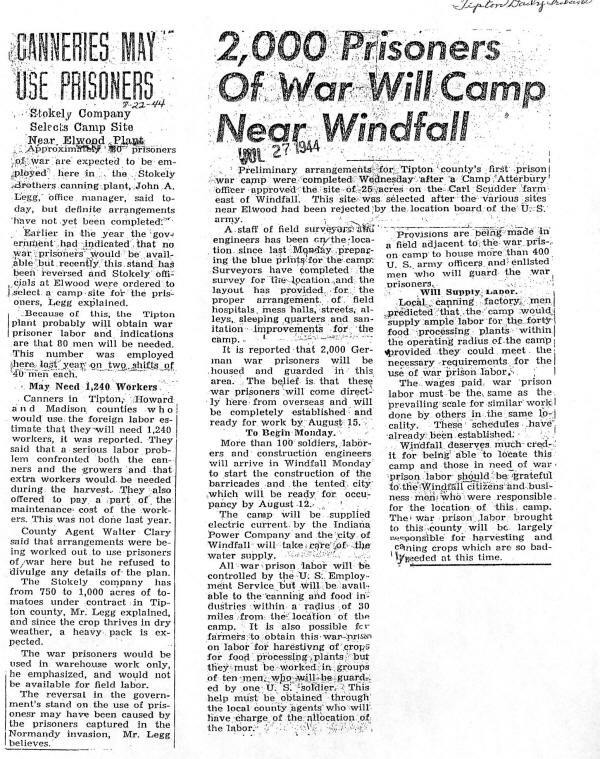 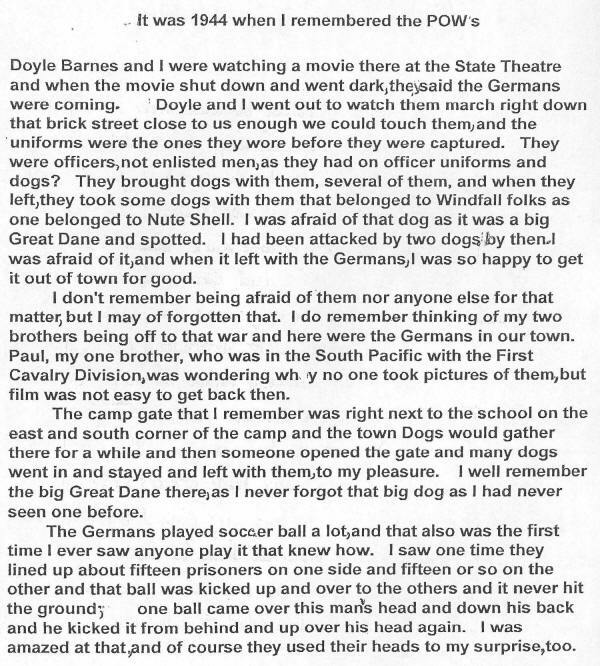 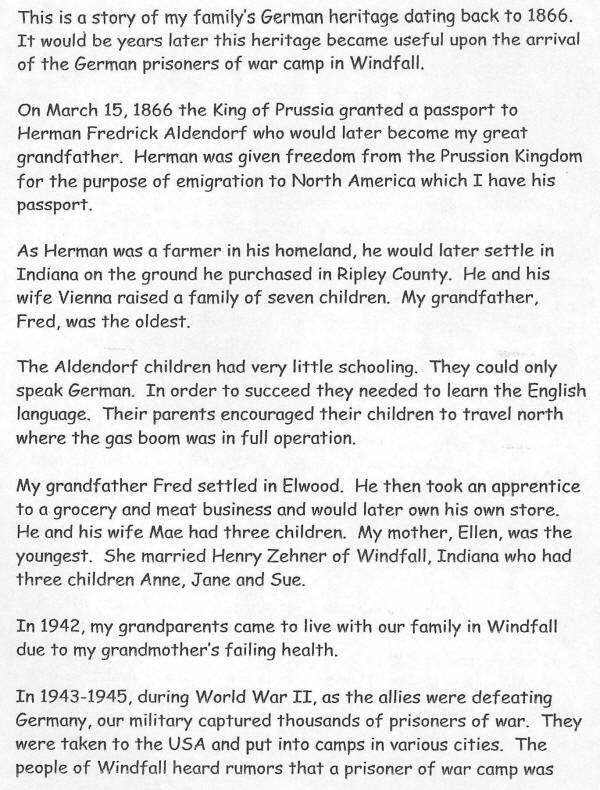 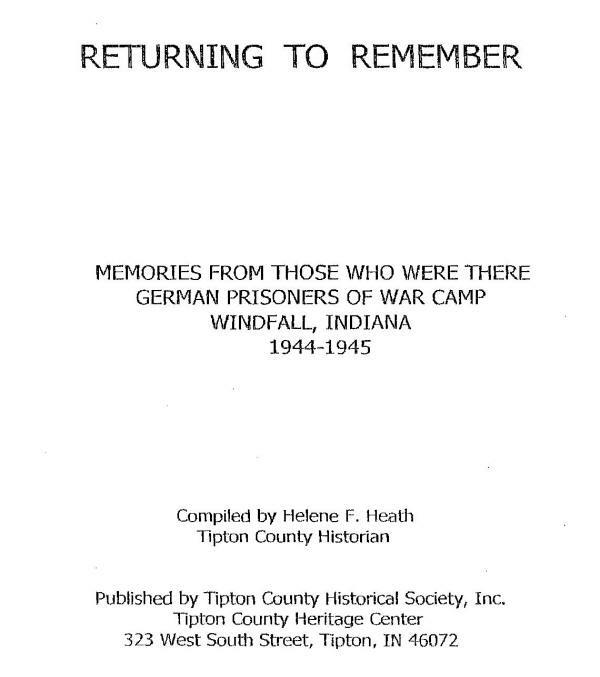 In 1944, a larger number of German POWs were brought into nearby Windfall. 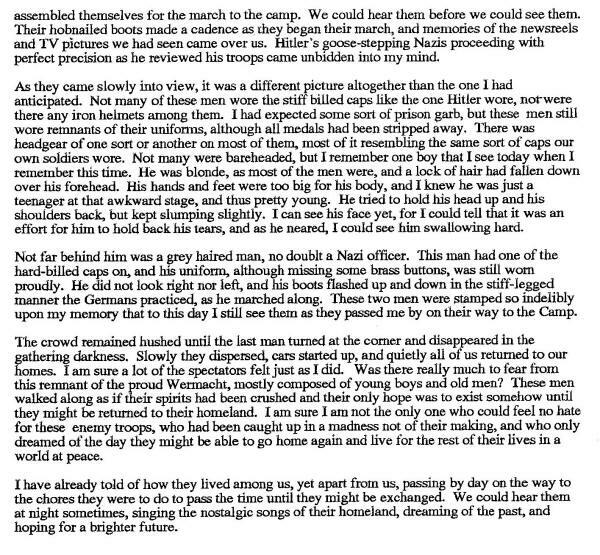 They were brought in on trains and then marched through the streets to the camp, frightening local residents. 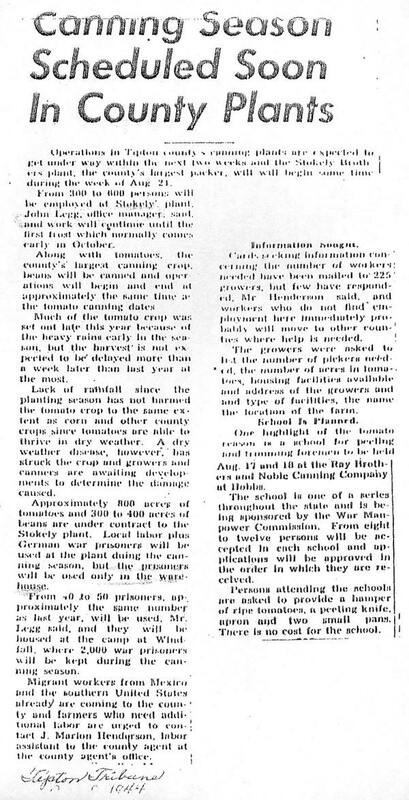 The Elwood prisoners were quickly assigned jobs picking tomatoes on farms and working in the local canneries. 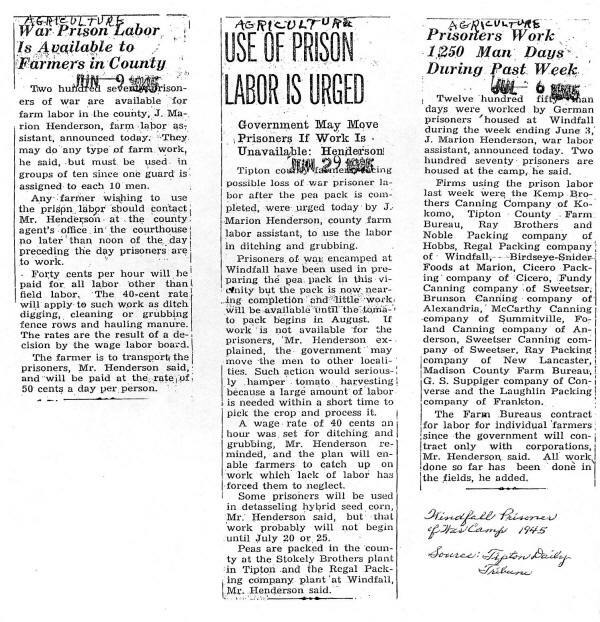 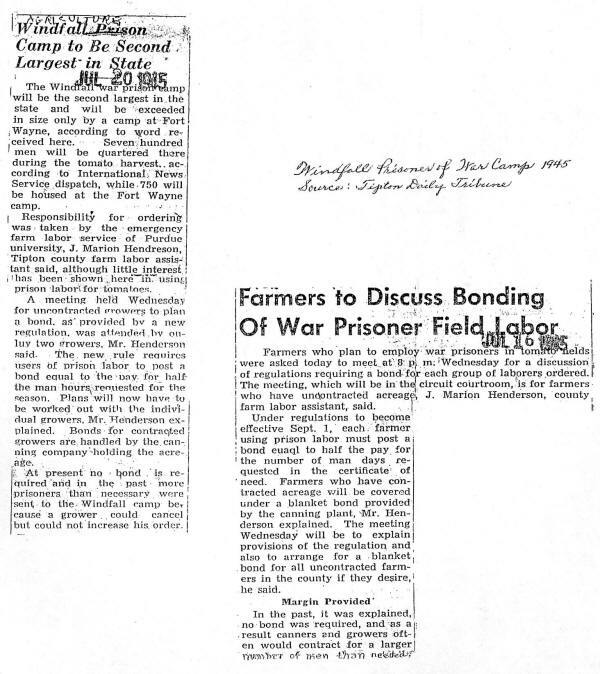 A few weeks after their arrival, the ‘Round Town’ column of the Call-Leader stated that, though many rumors had circulated about the prisoners, no problems had been reported and that those farmers who had employed the prisioners reported being happy with the work they died. 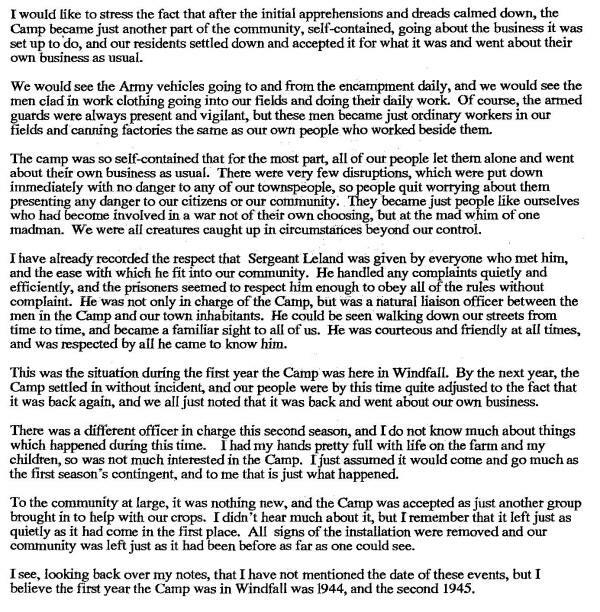 A visit by the local police chief to the camp reported no problems. 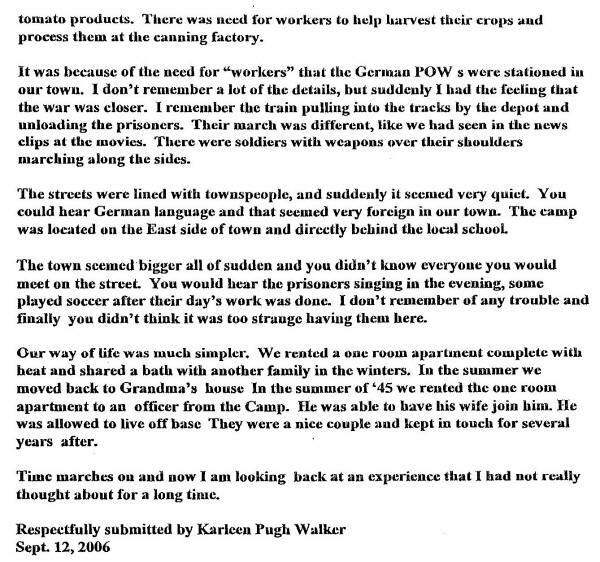 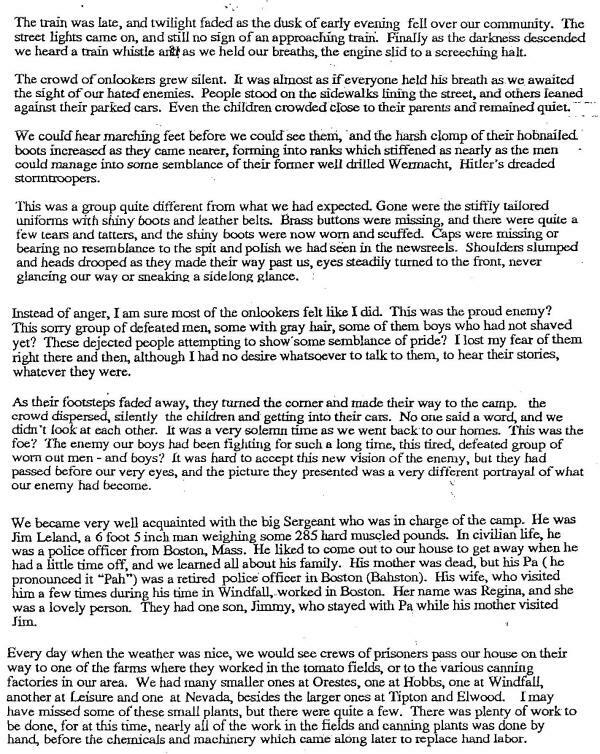 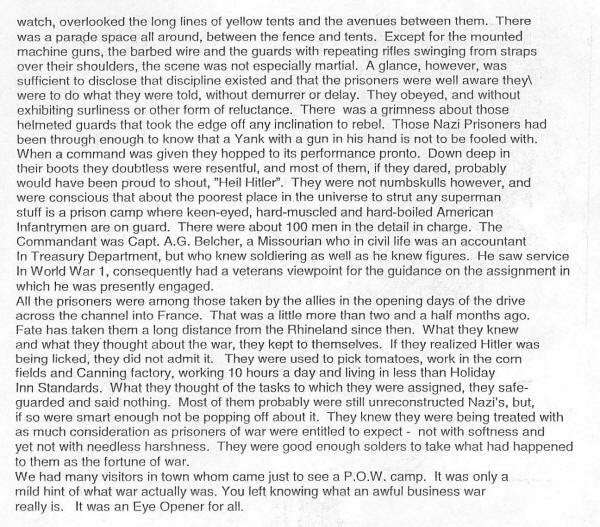 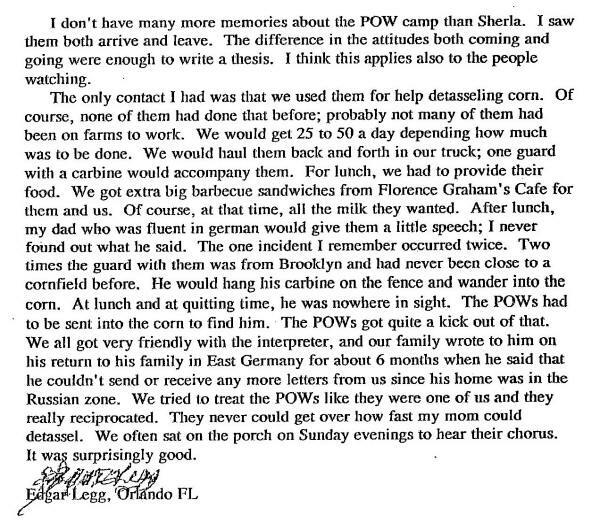 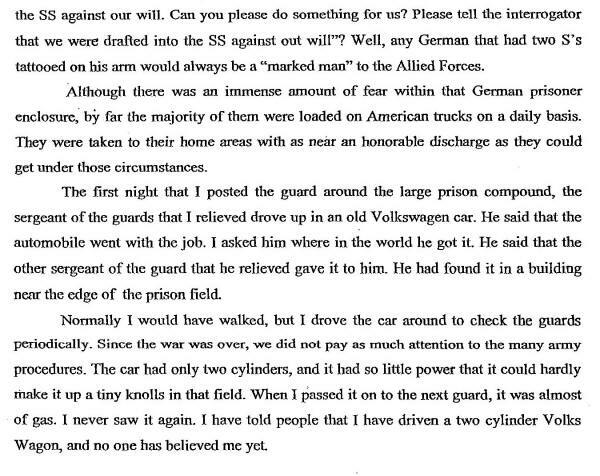 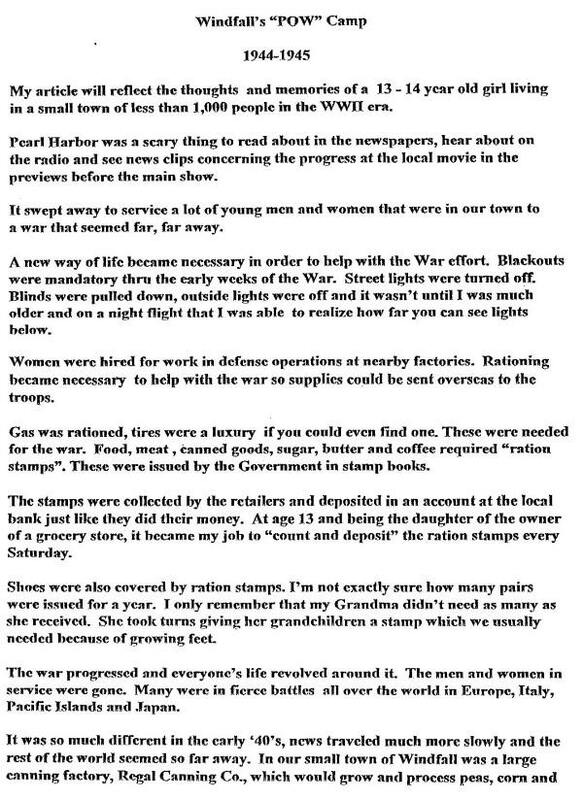 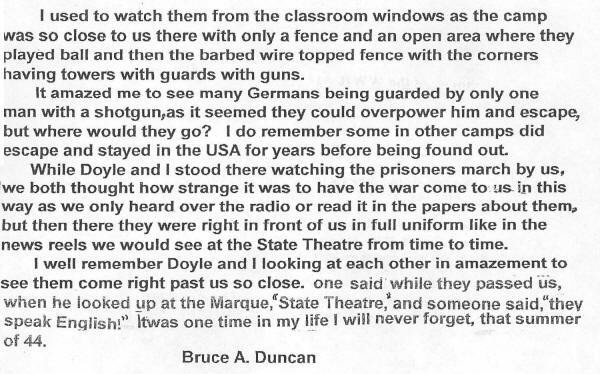 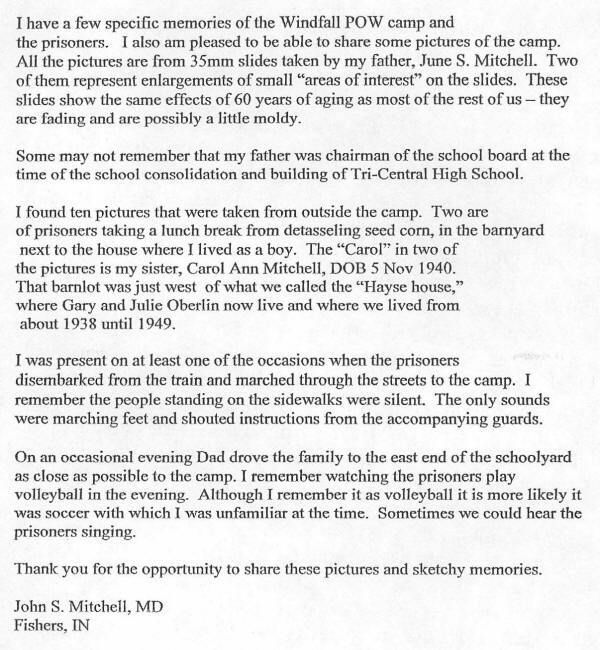 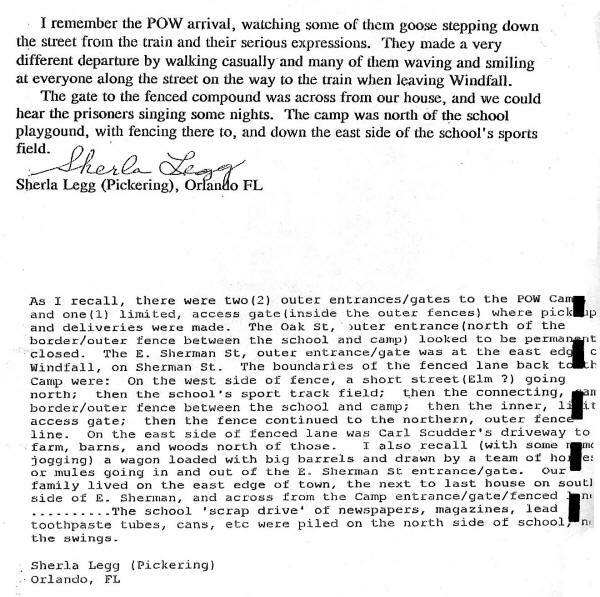 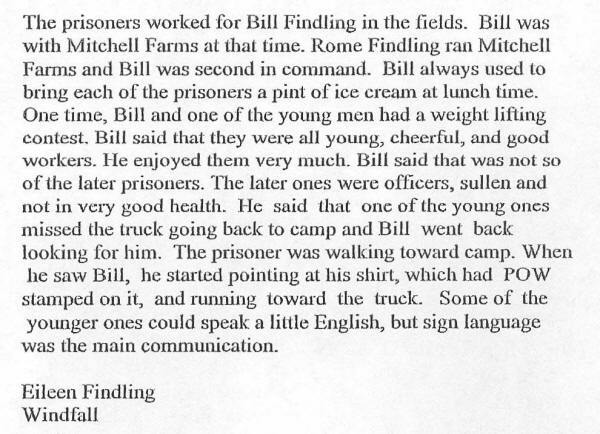 While most of the community had little contact with the POWs, the soldiers who guarded them were a different story. 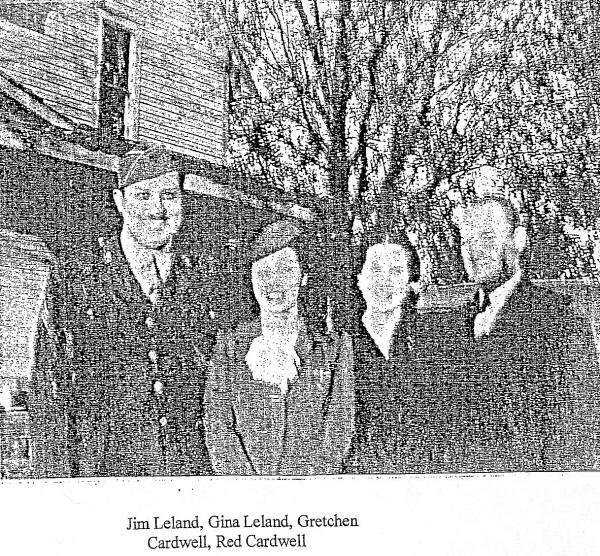 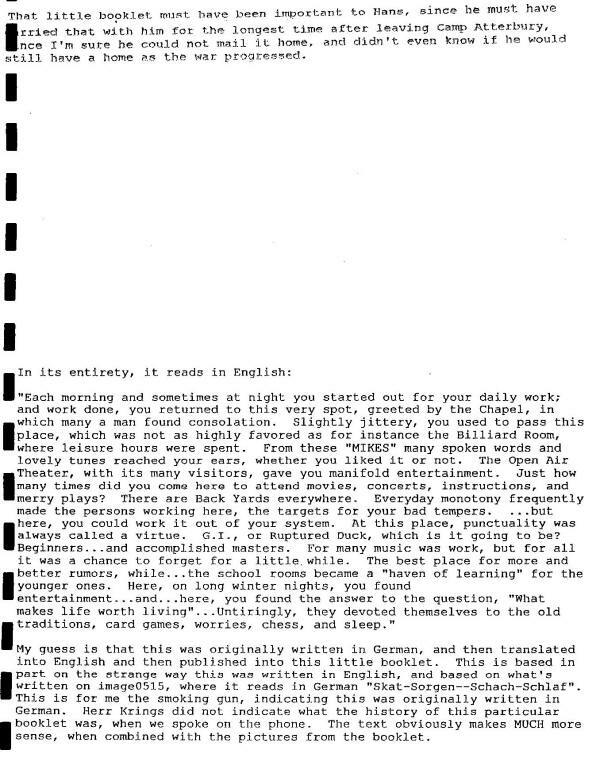 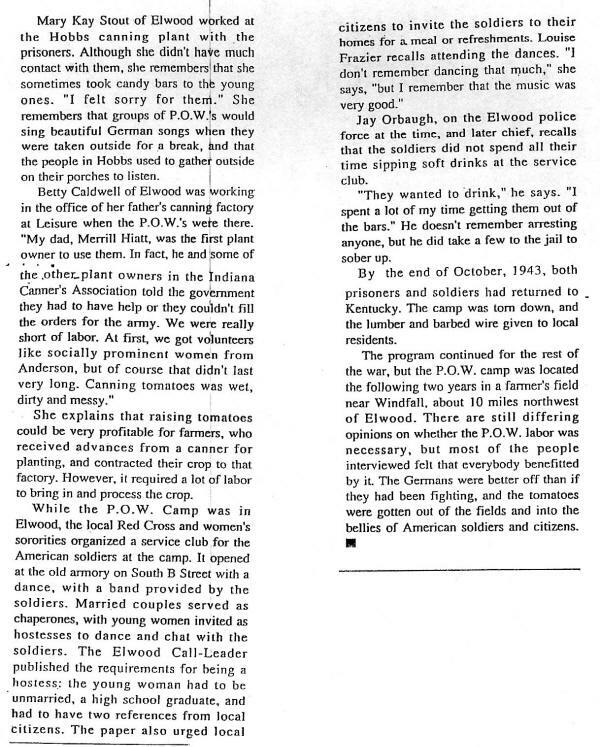 Elwood formed a Service Club, which maintained a Canteen for the guard soldiers and several events to entertain them were organized. 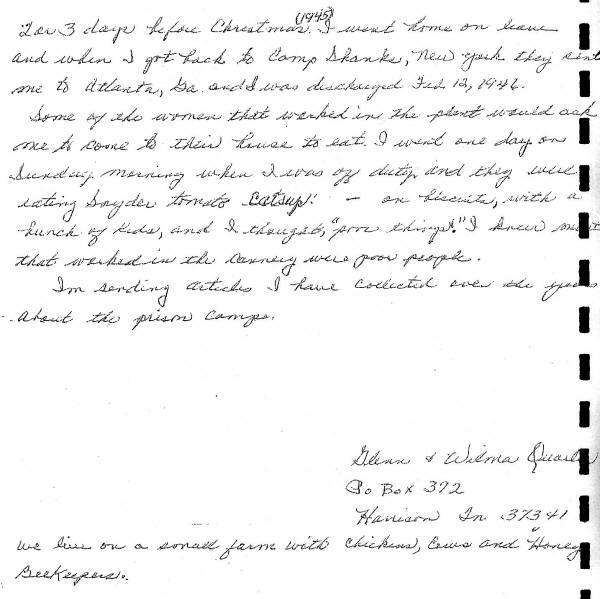 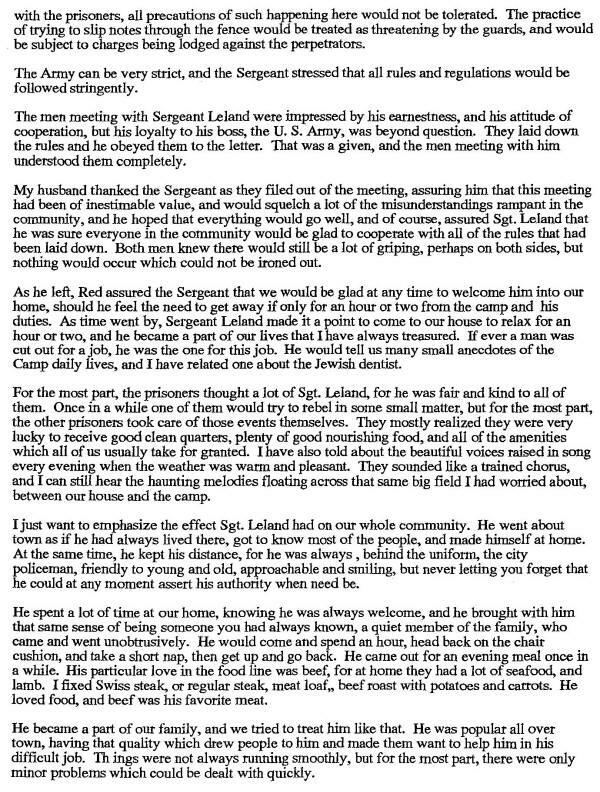 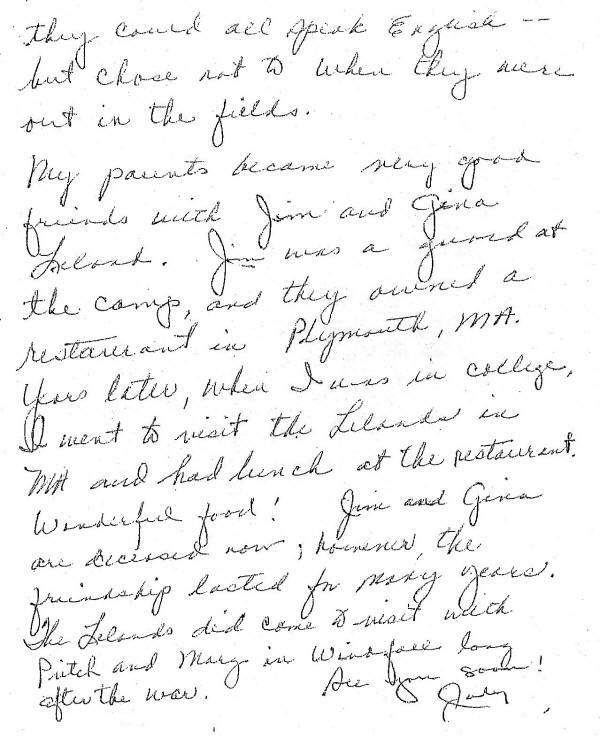 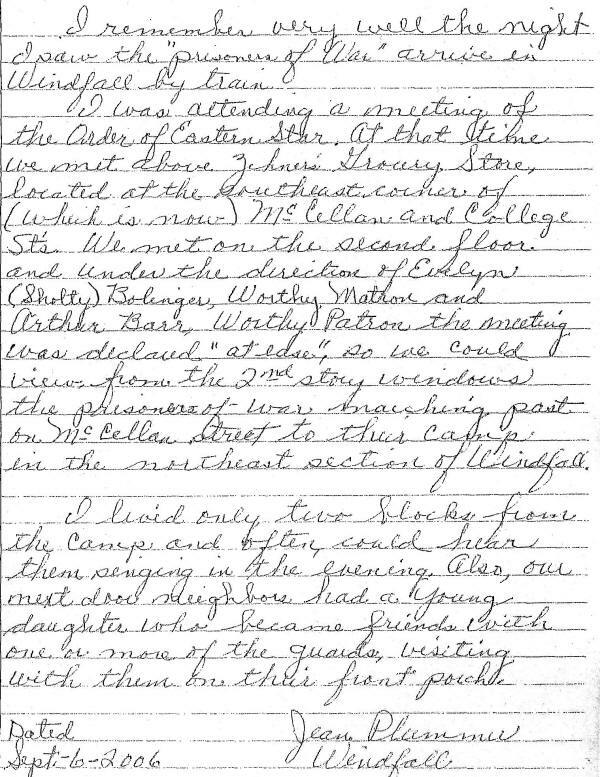 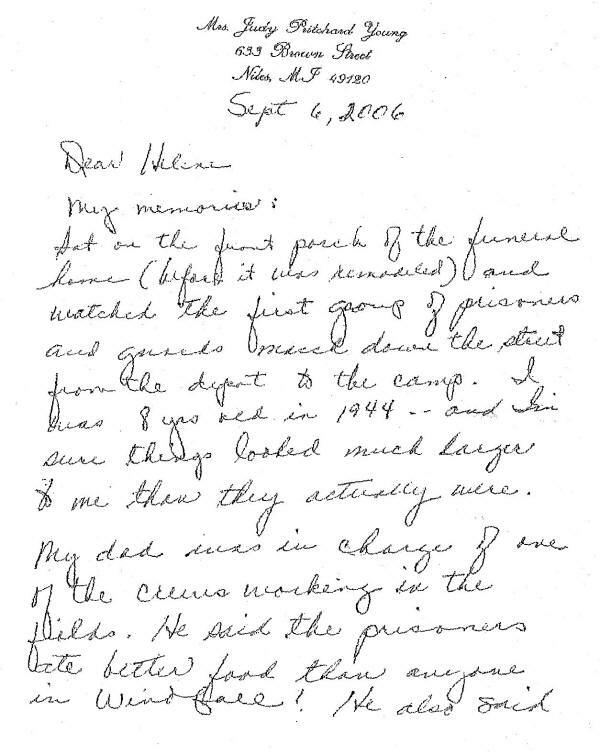 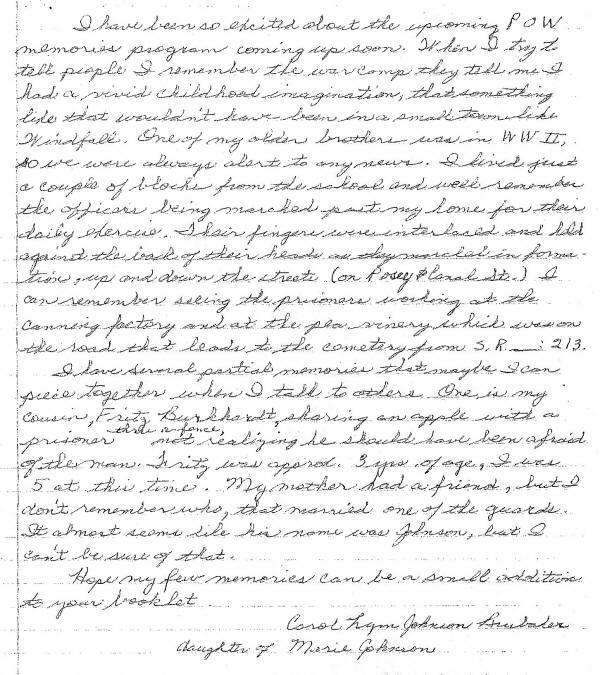 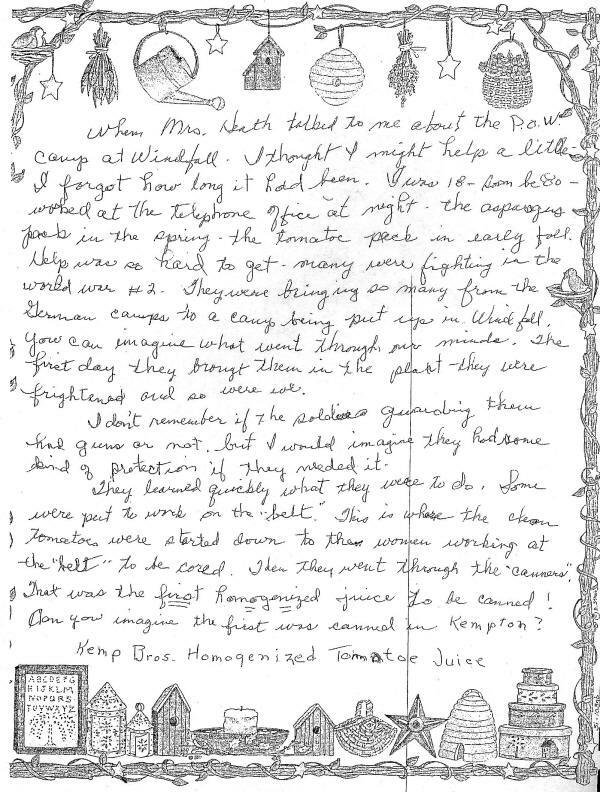 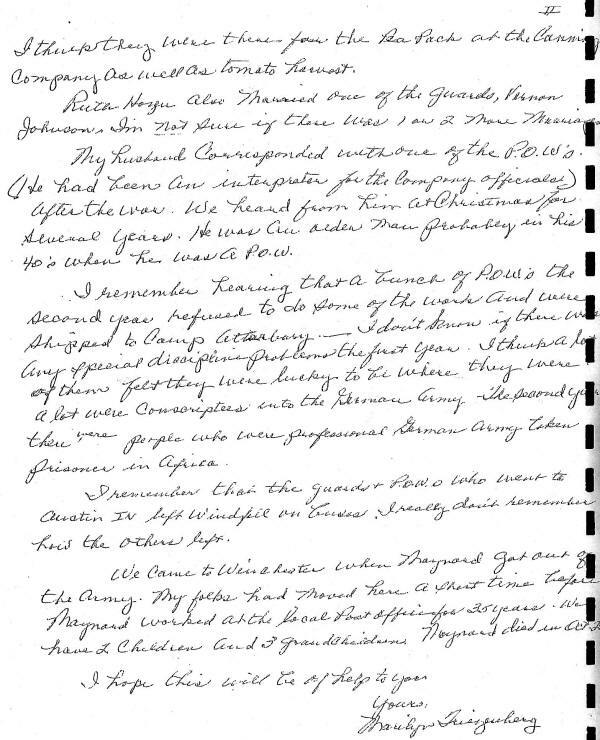 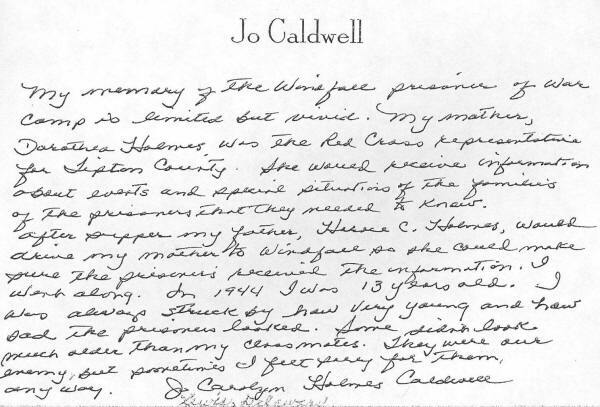 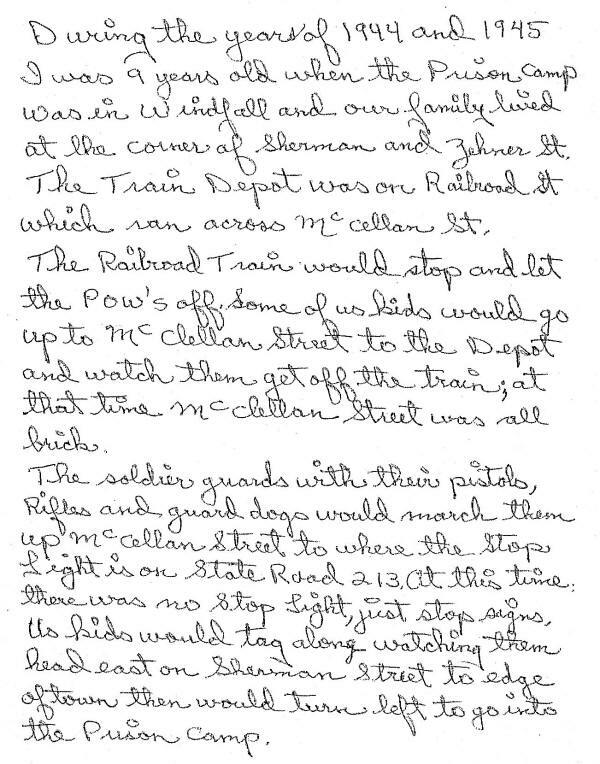 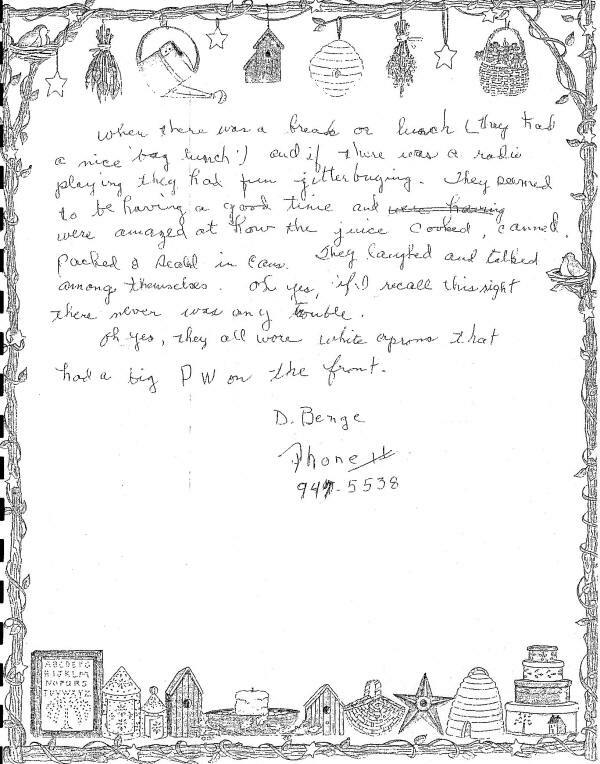 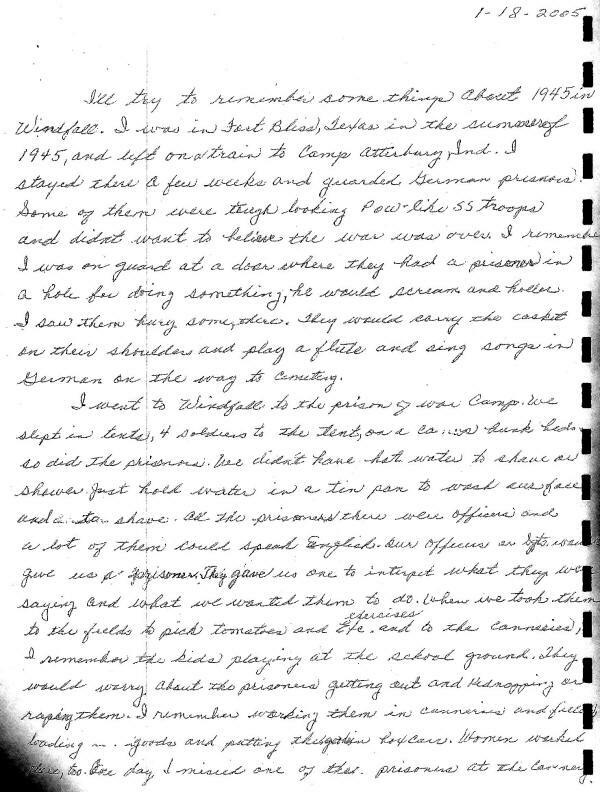 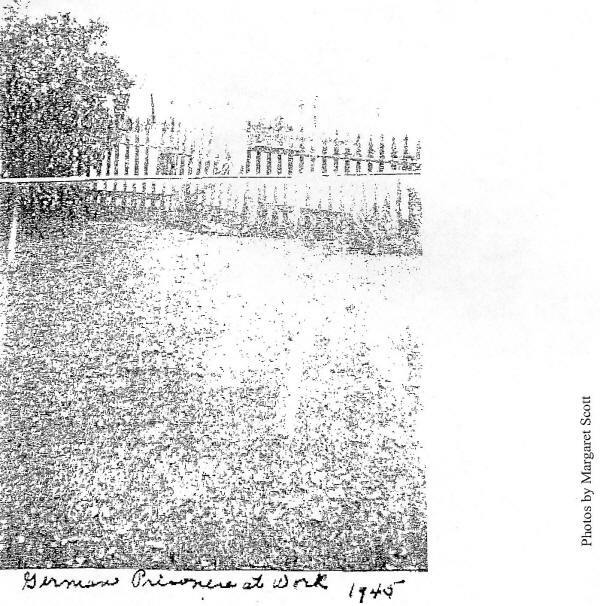 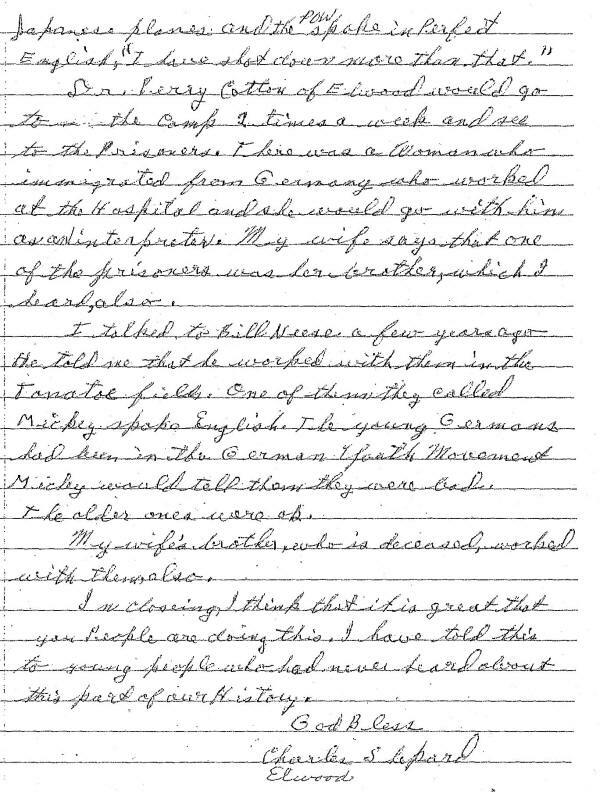 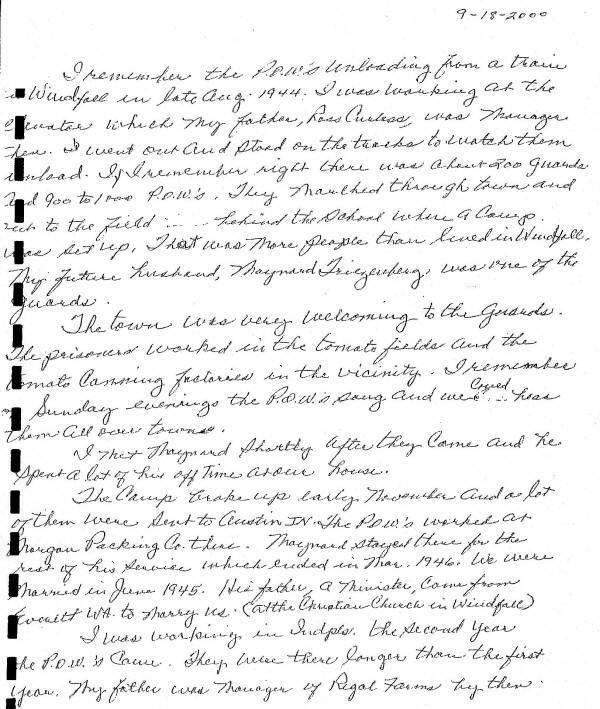 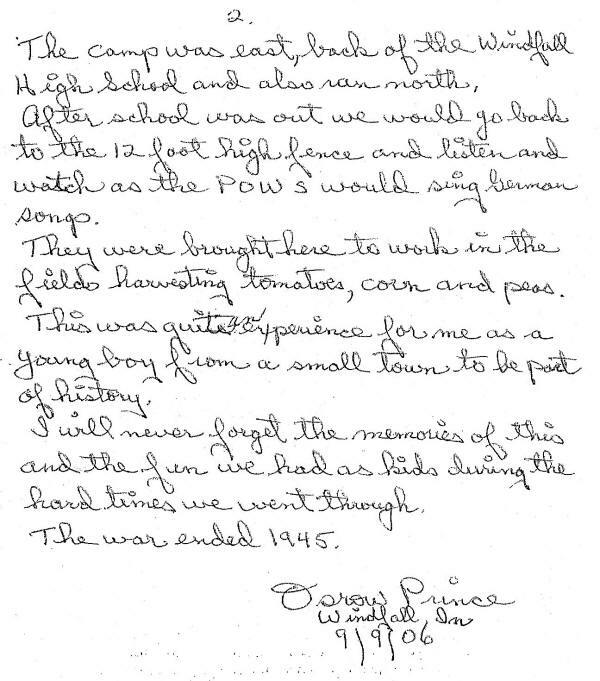 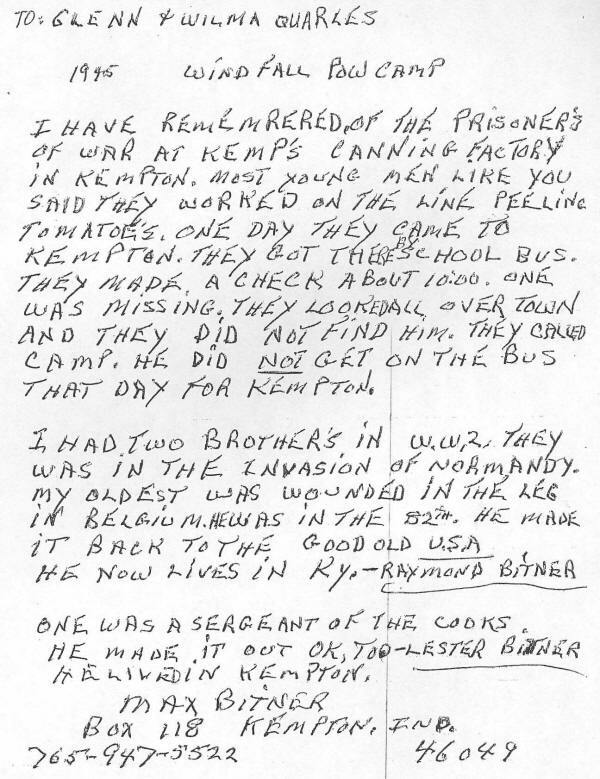 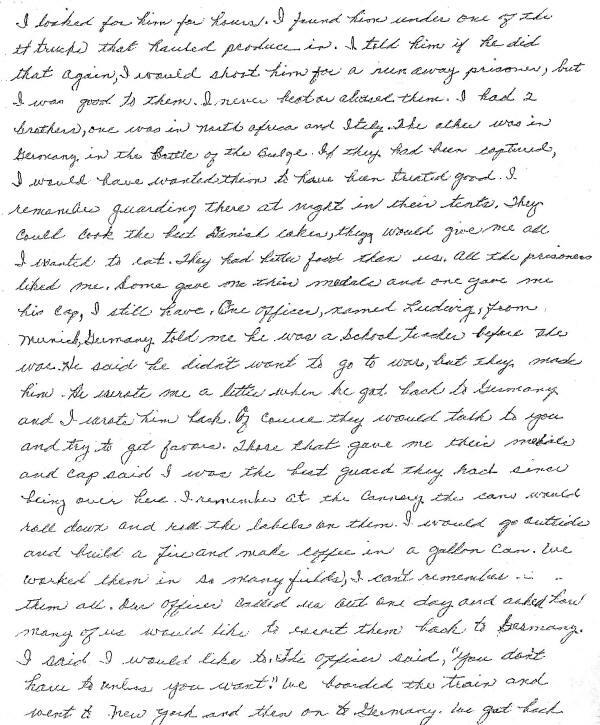 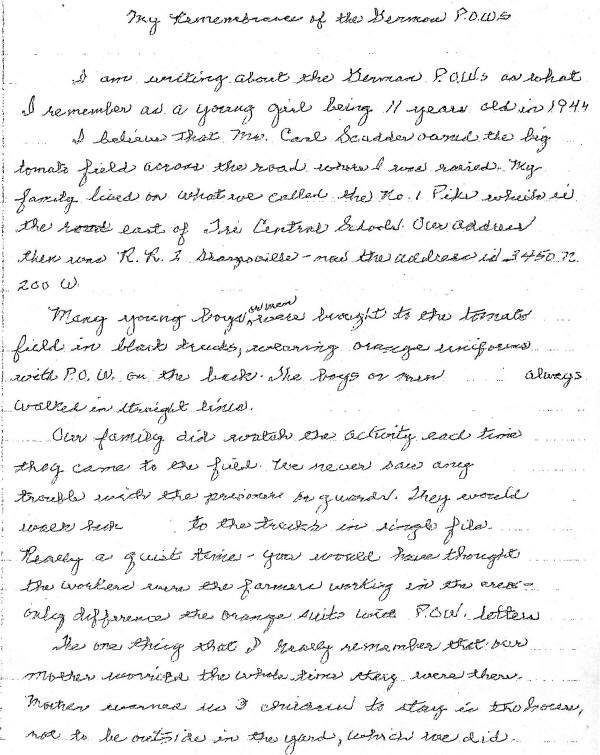 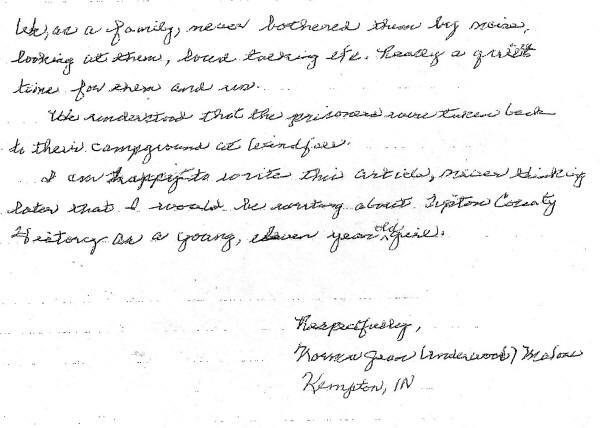 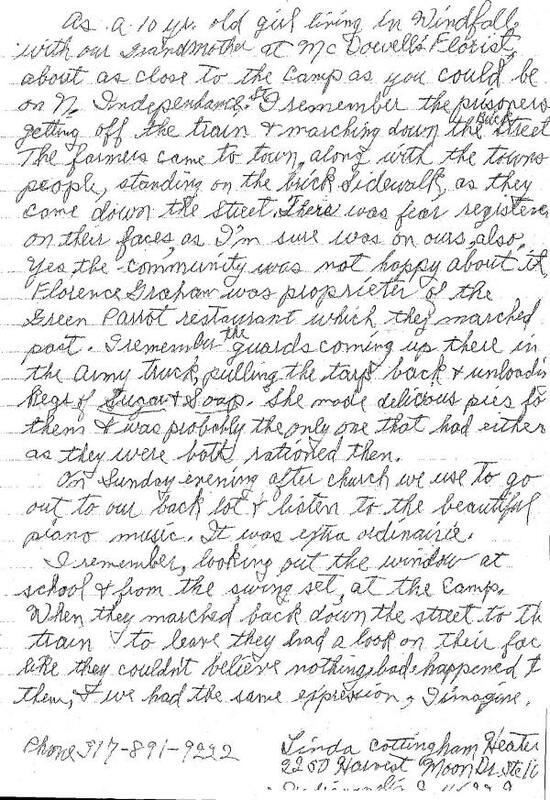 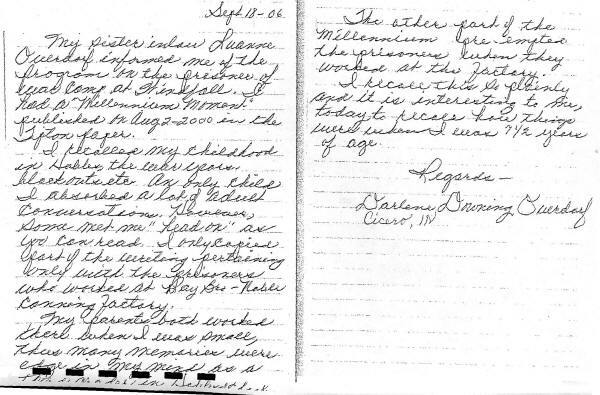 When the POWs were returned to Camp Breckenridge, two thank-you notes from the guard regiment appeared in the Call-Leader, expressing great satisfaction with their stay in Elwood. 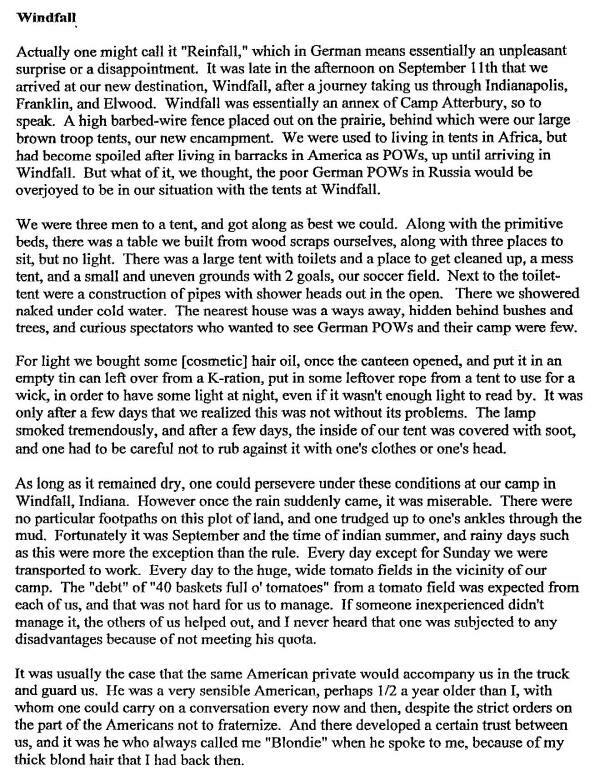 By late October, the tomatoes were harvested and POWs were taken back to more permanent quarters. 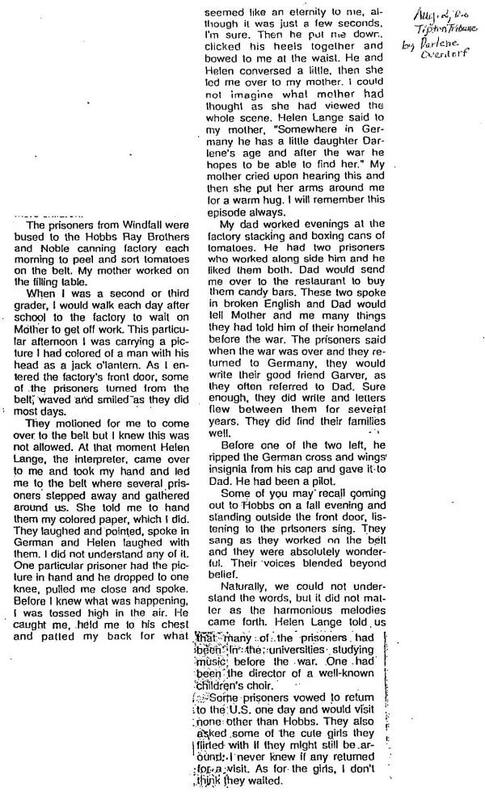 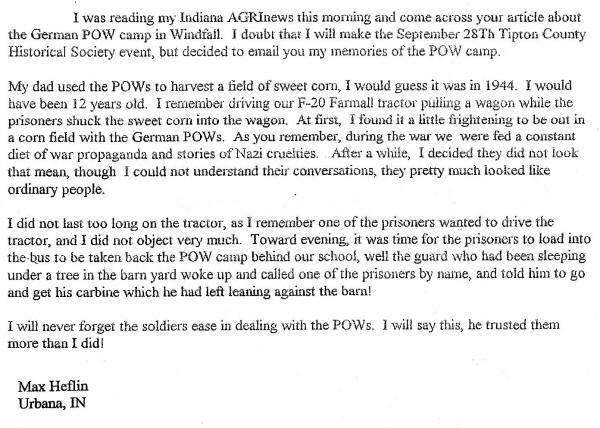 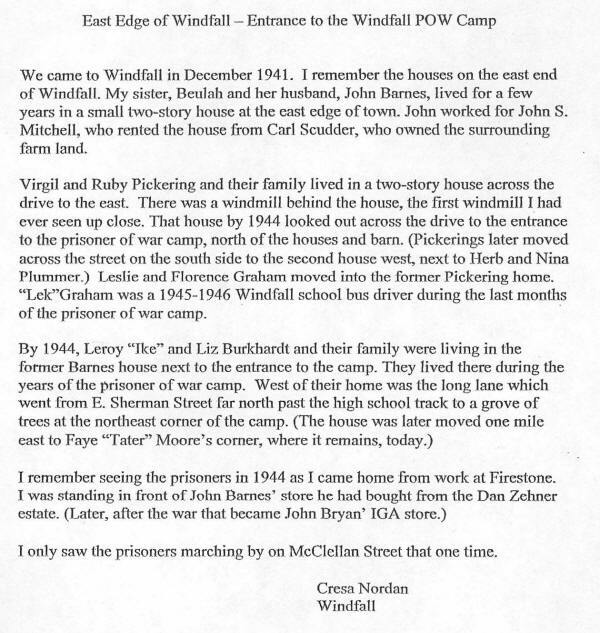 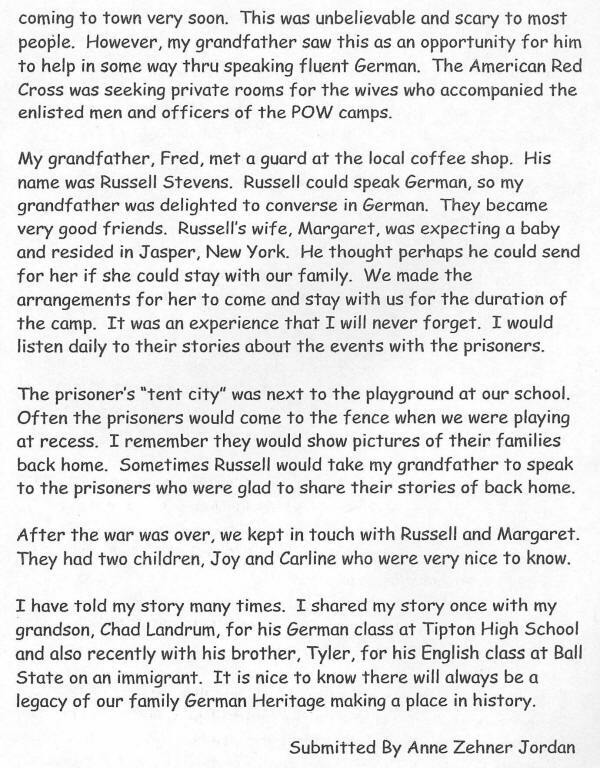 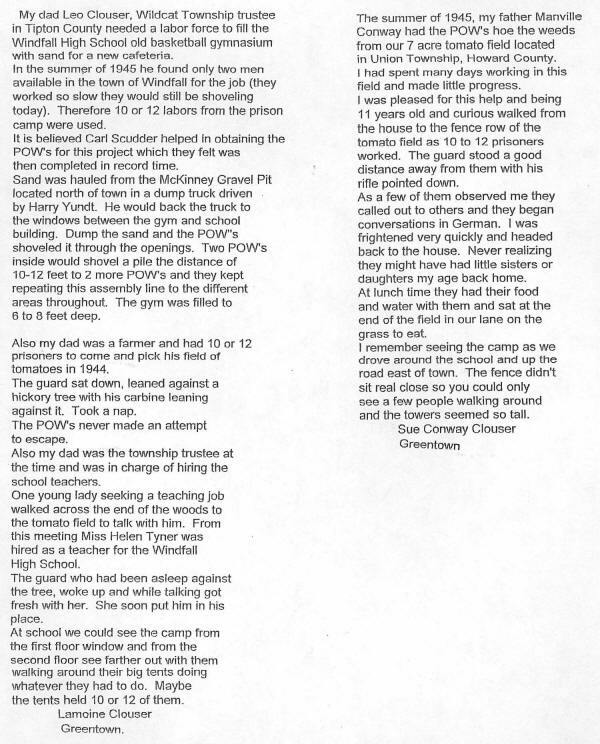 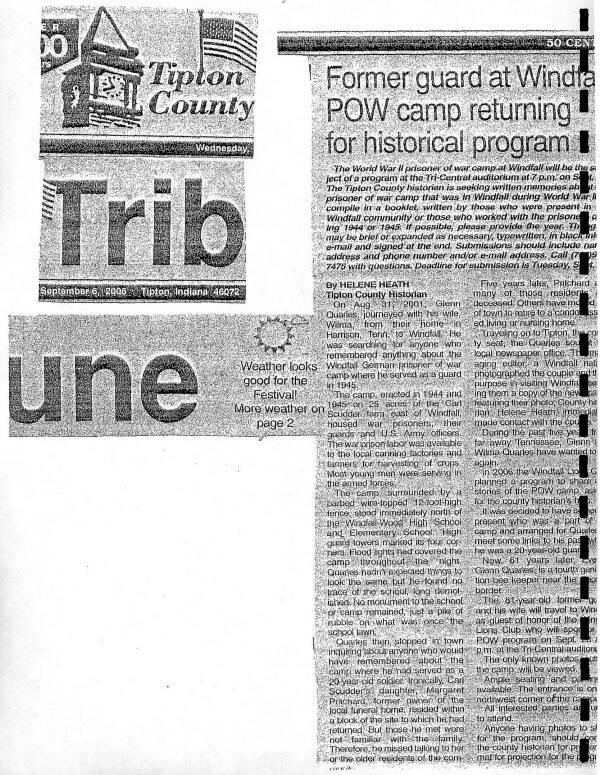 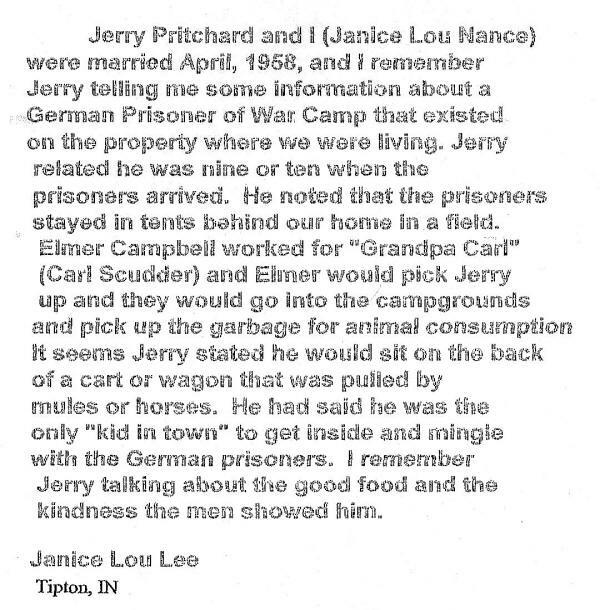 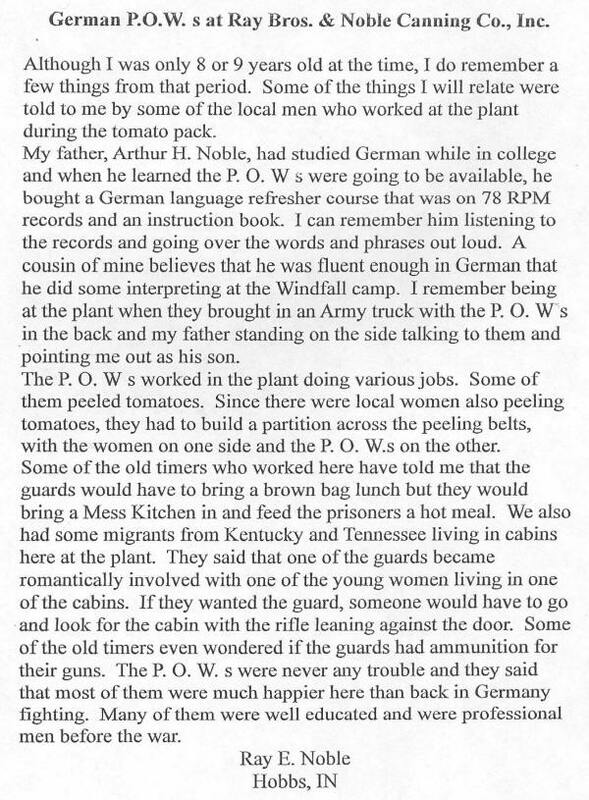 The Elwood camp was disbanded, but POWs continued to help with the Madison County harvest. 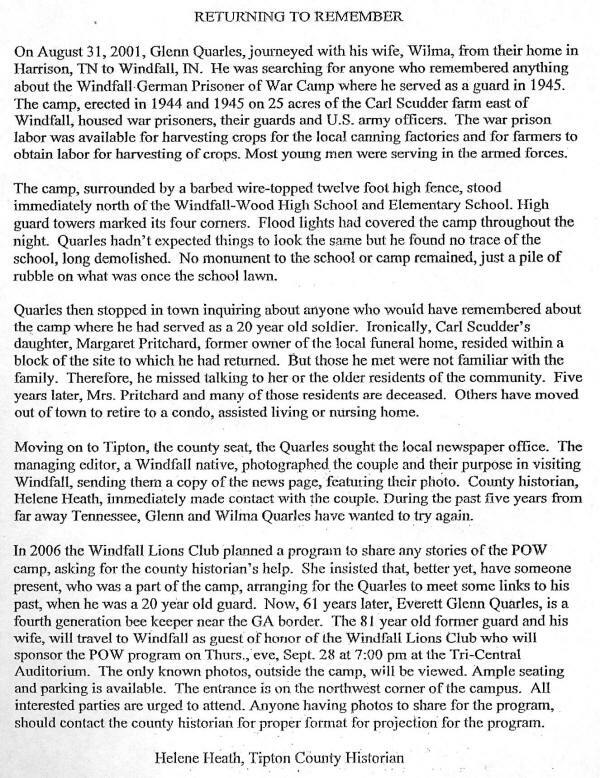 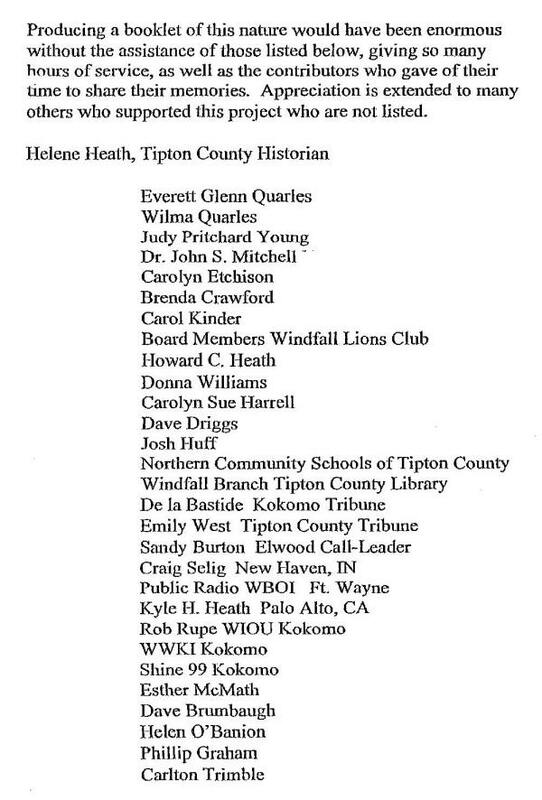 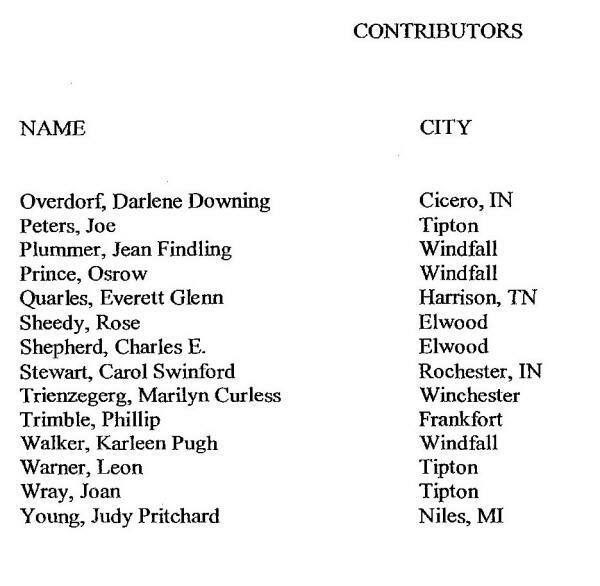 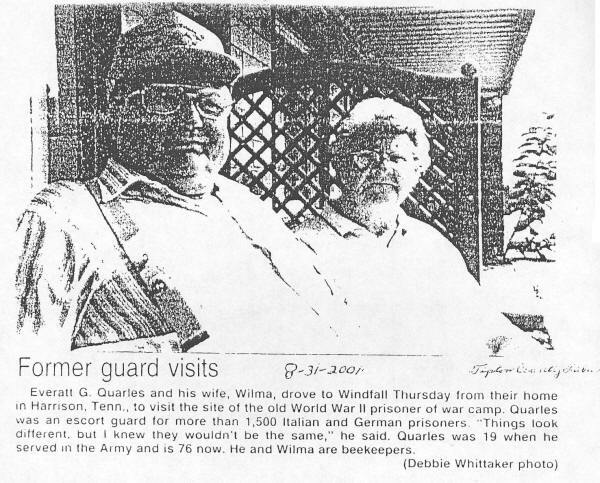 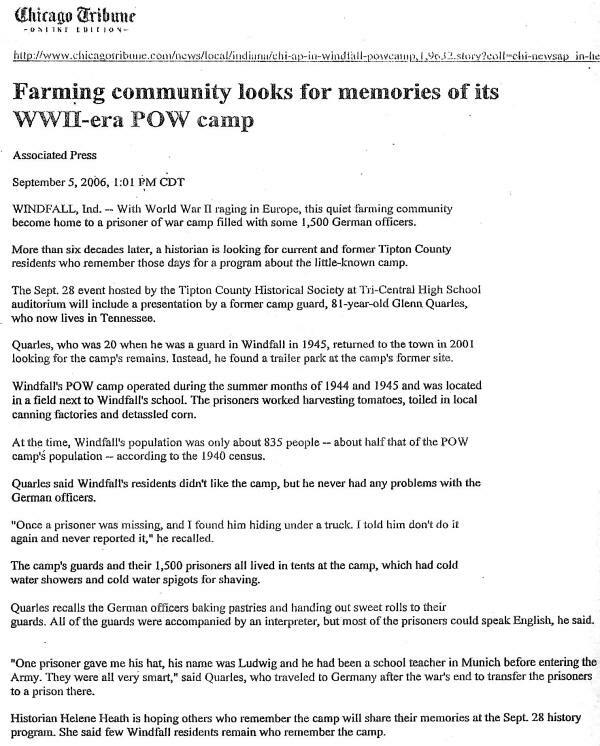 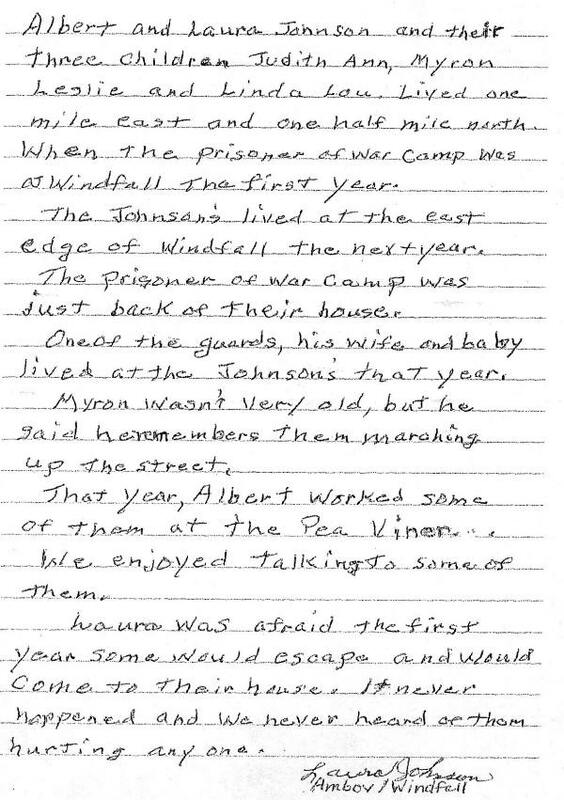 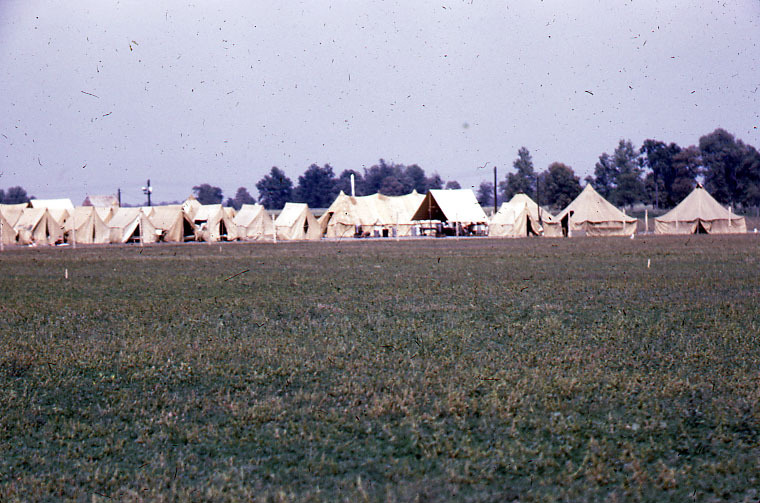 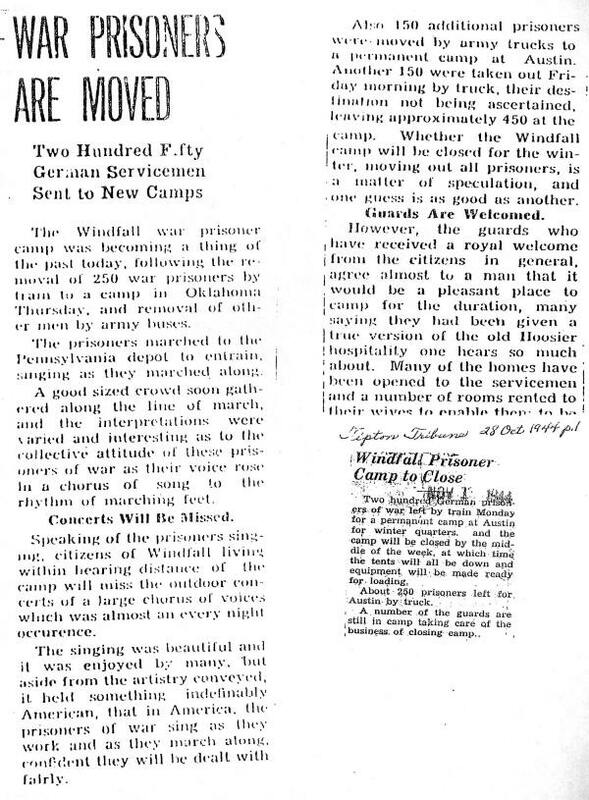 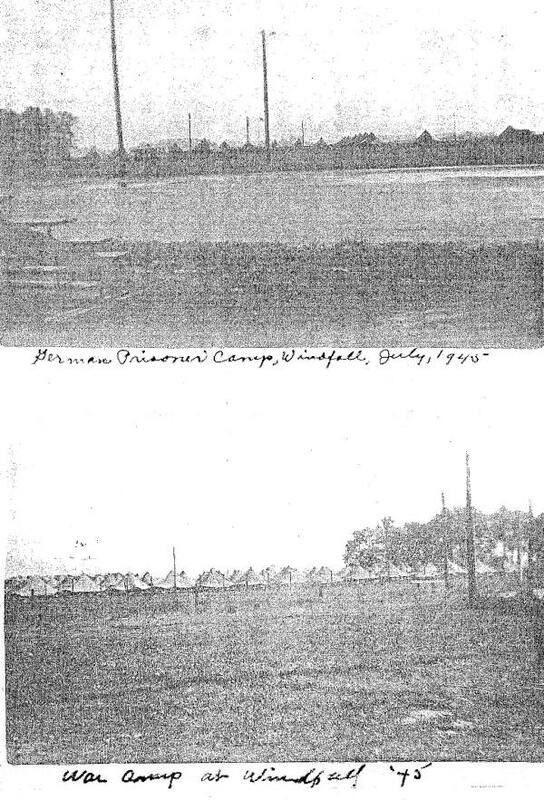 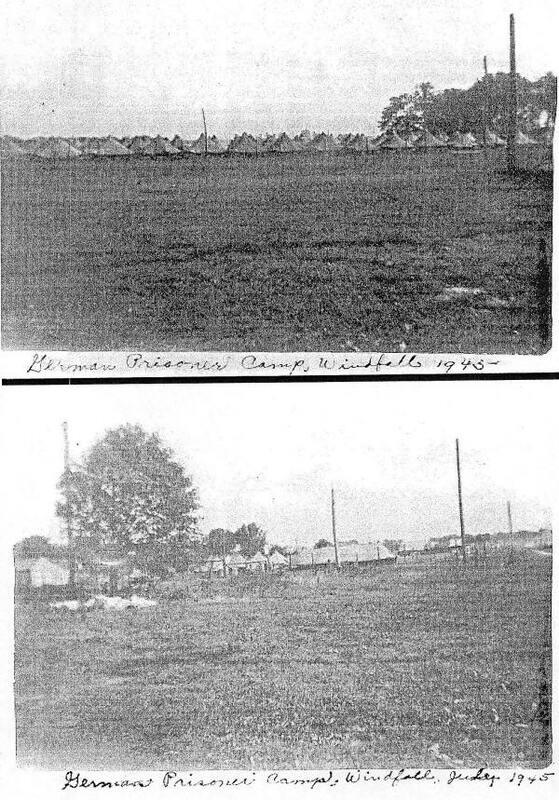 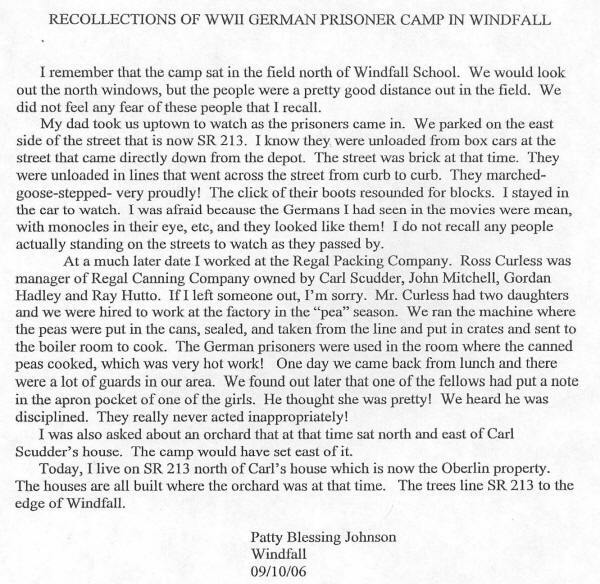 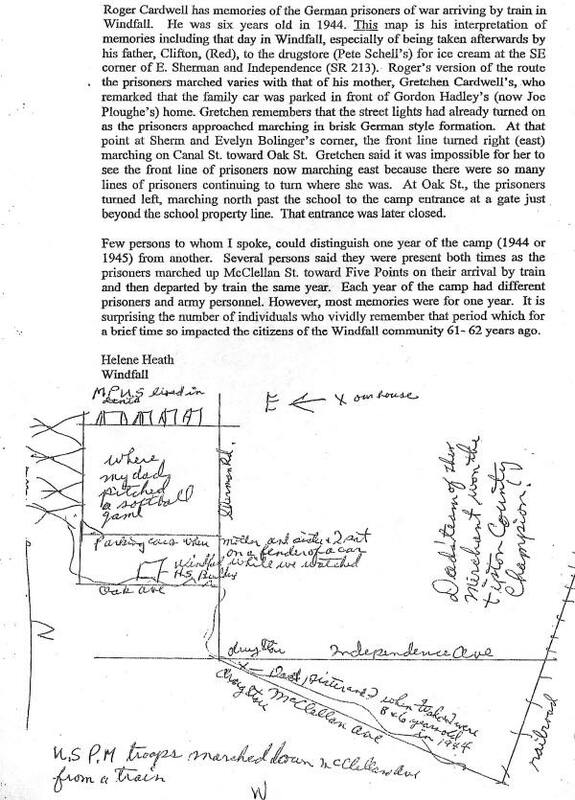 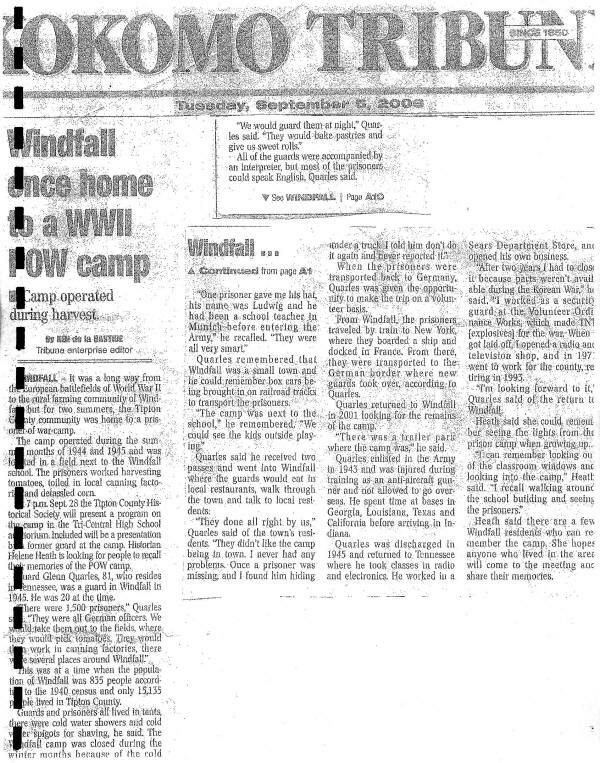 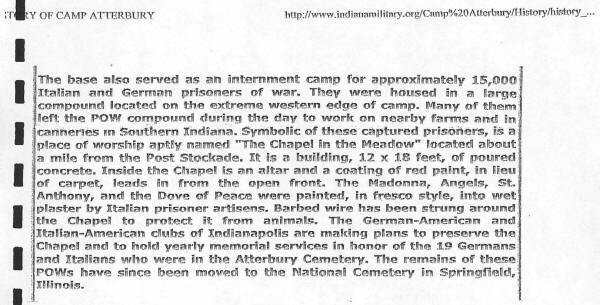 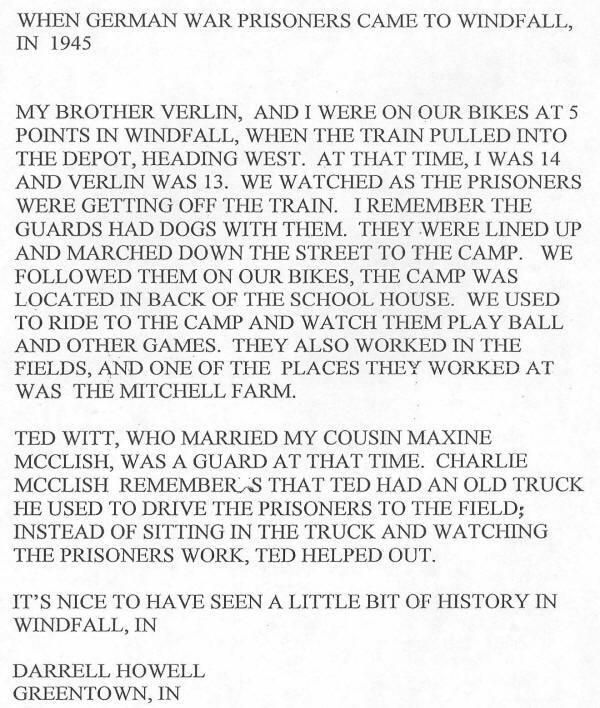 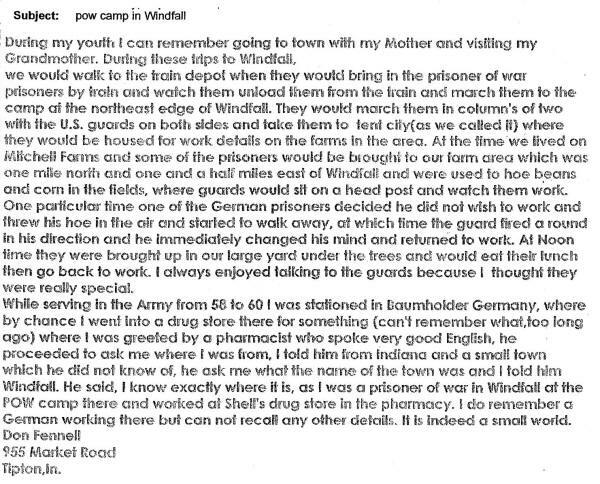 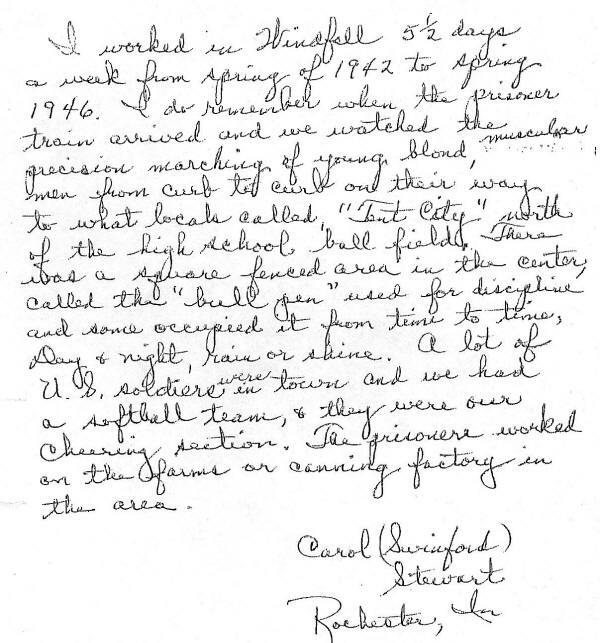 A more permanent camp was built in nearby Windfall in Tipton County where they would be housed for two more summers. 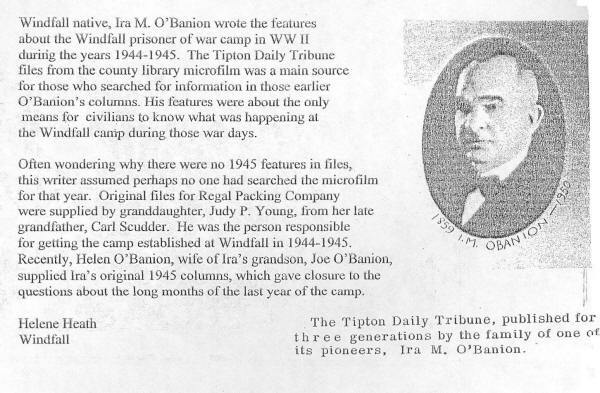 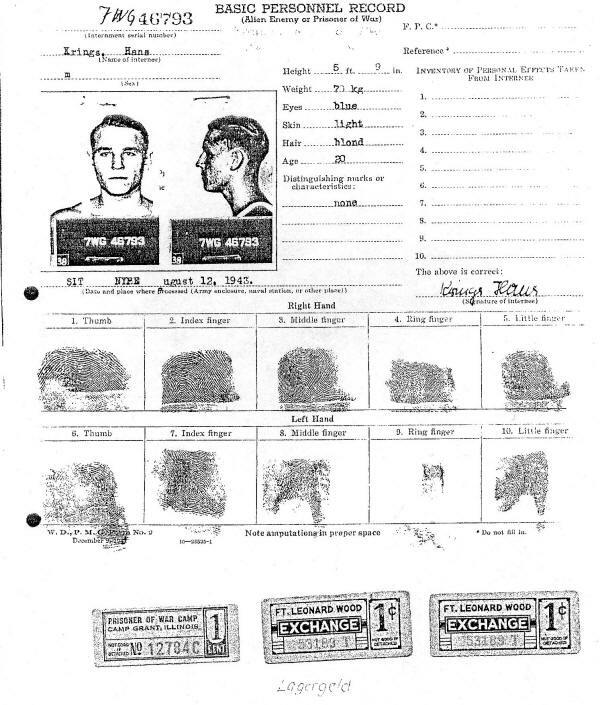 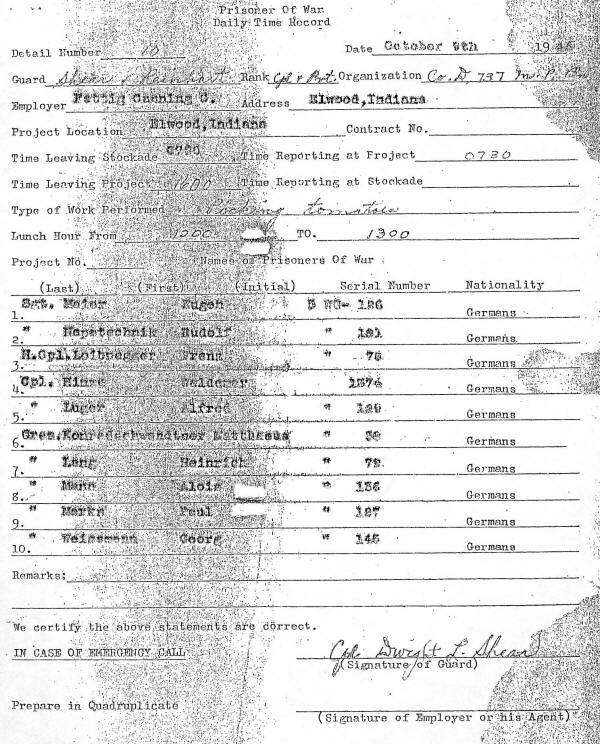 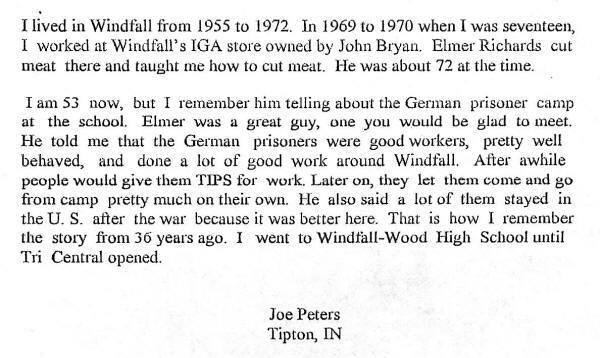 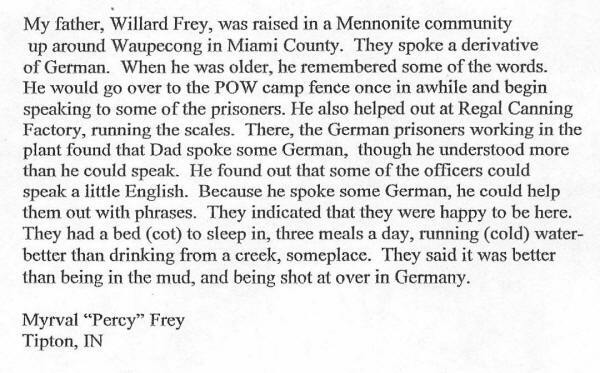 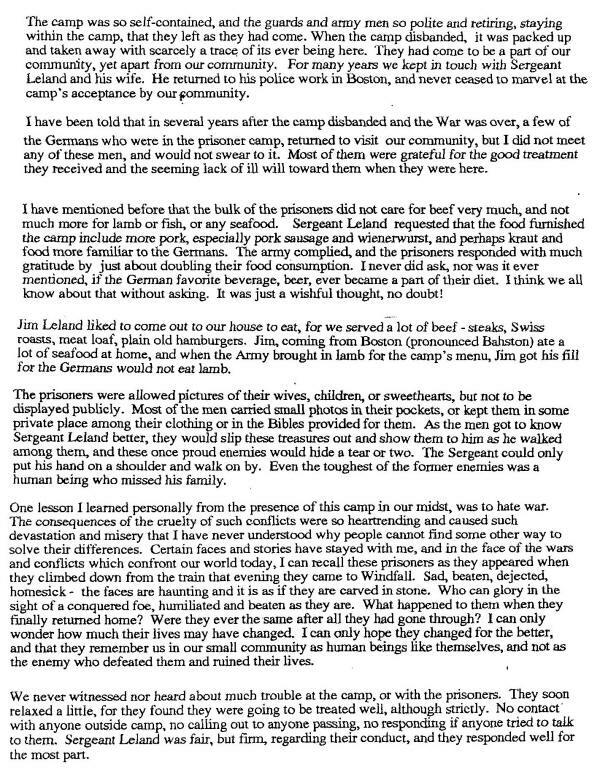 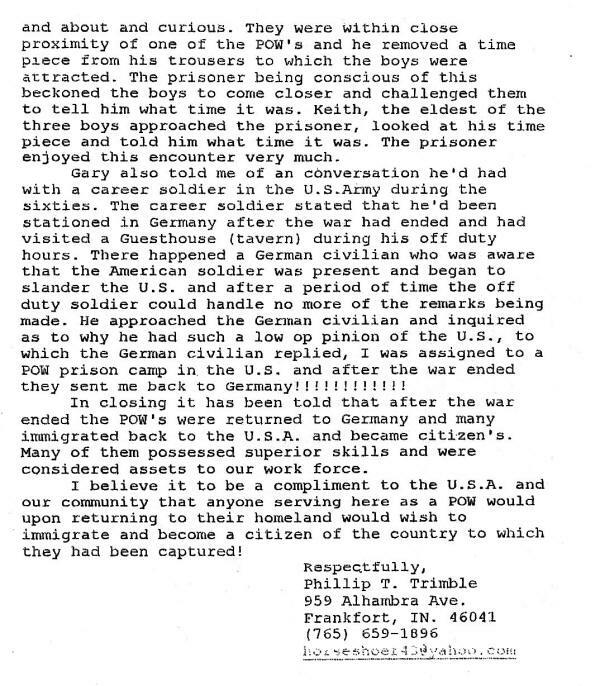 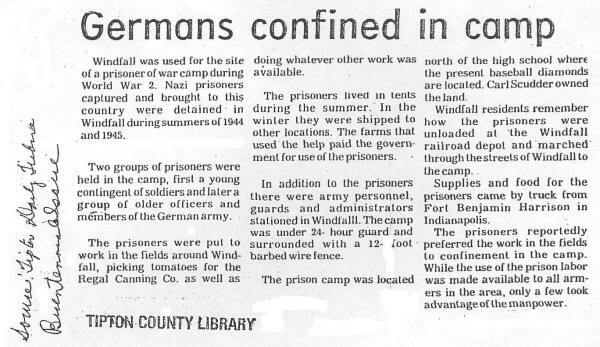 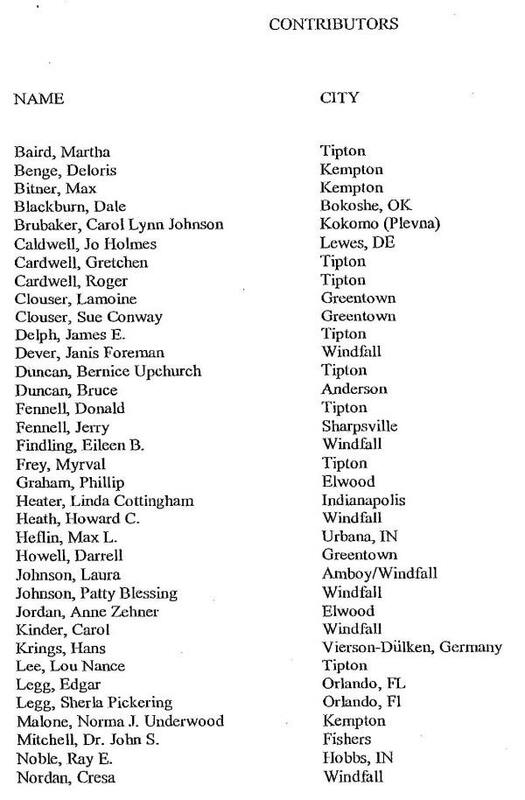 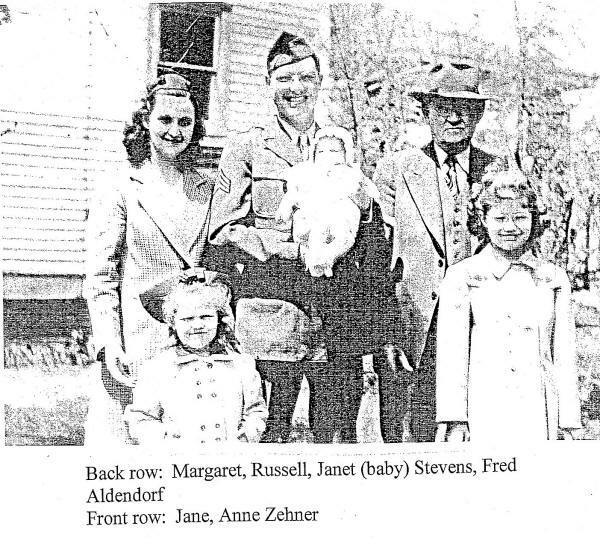 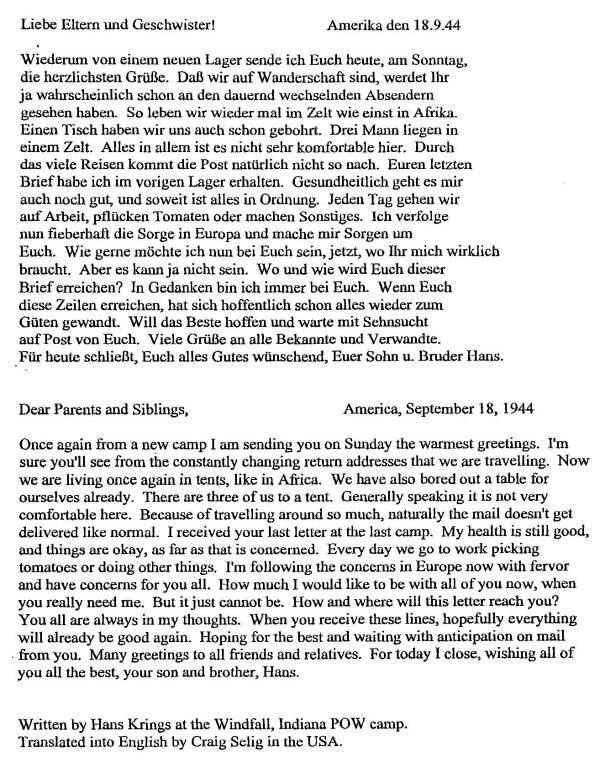 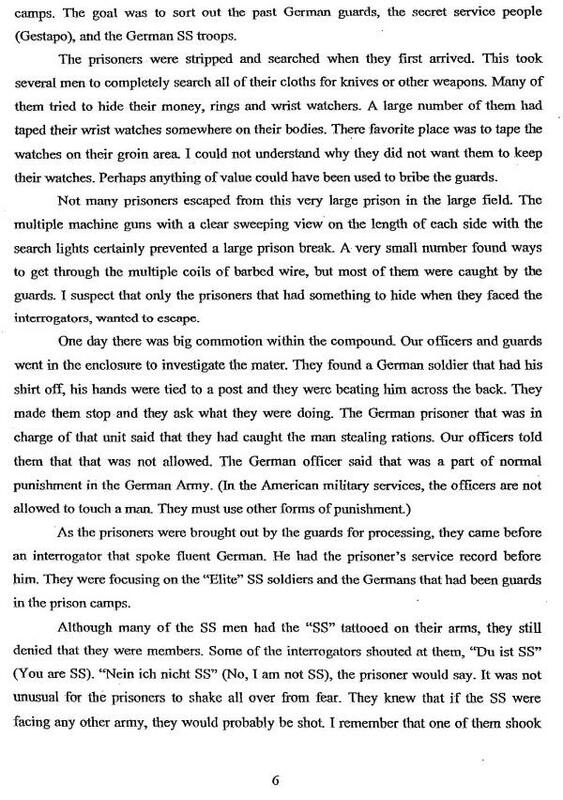 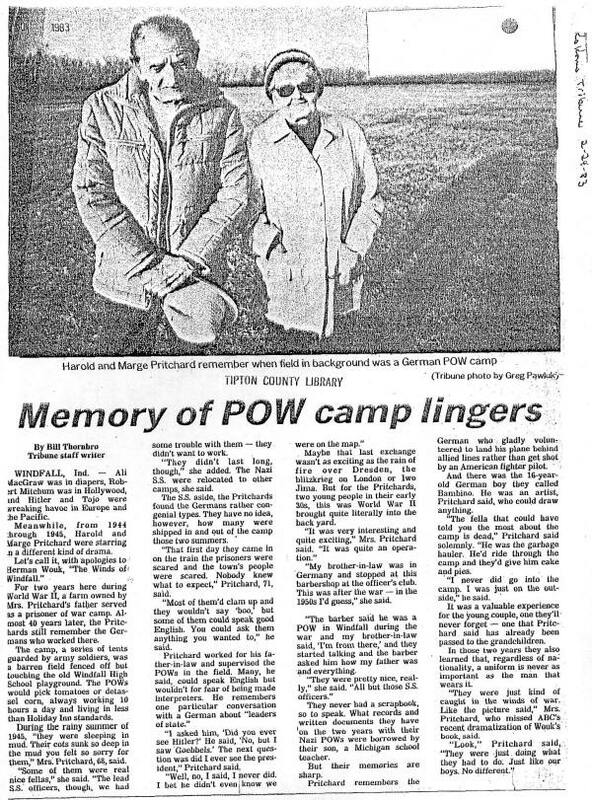 The POWs who were kept in Madison and Tipton Counties were just a few of the 425,000 German prisoners who were housed on U. S. soil during World War II. 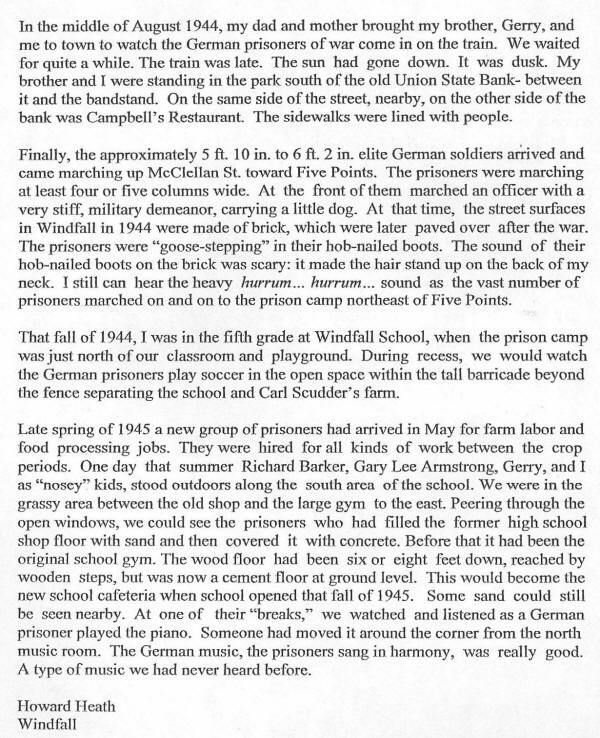 Exerpts taken from an article in the Sunday, April 26, 2009, Herald Bulletin. 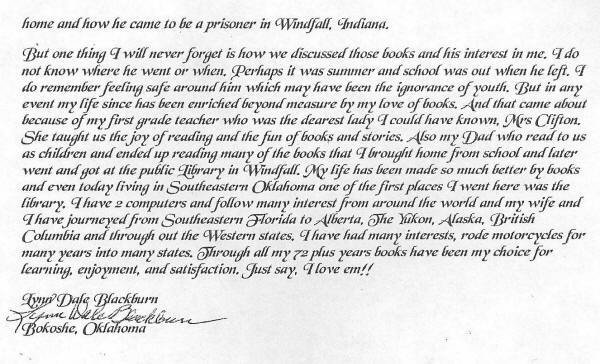 Written by Beth Oljace, Anderson Public Library, Indiana Room. 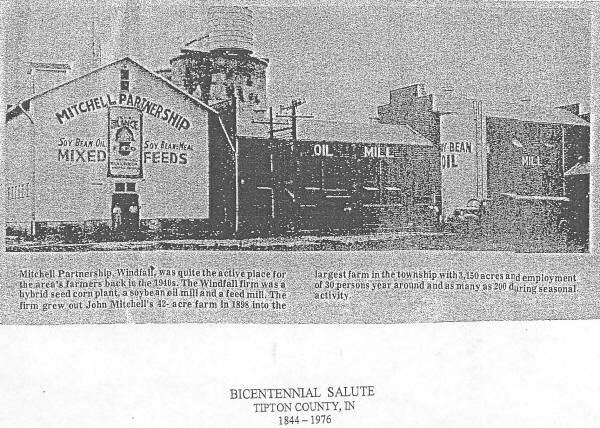 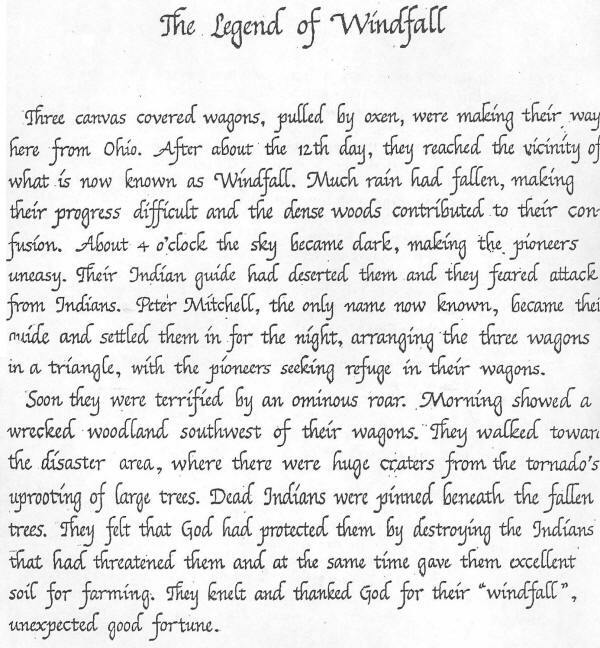 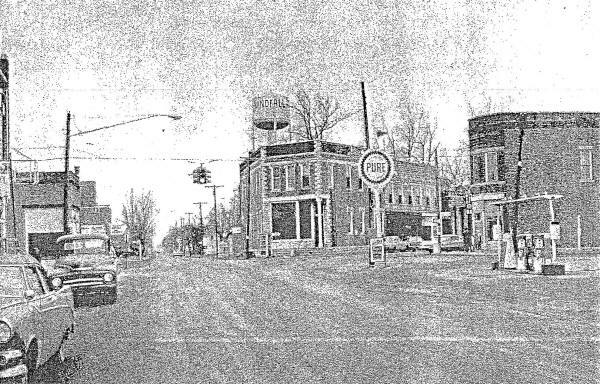 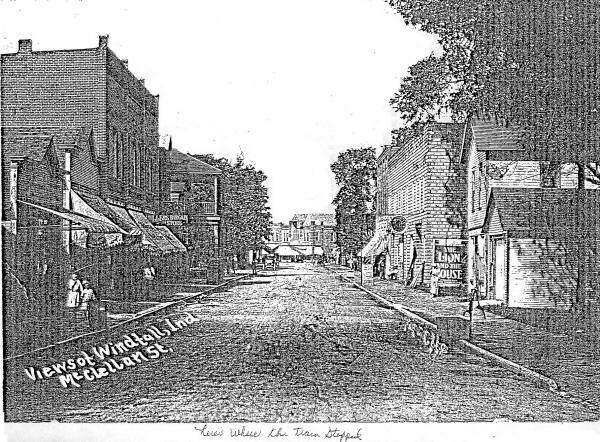 The history of Madison County, Indiana and its people, industry and events.